Hello there! 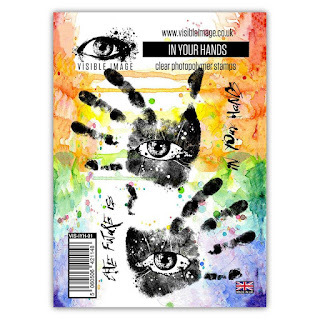 Hands up who bought some of the new Visible Image zodiac stamps? Well do you love them? We in the team have had a wonderful time playing with them. Today I’m sharing one of my designs using the Zodiac Leo Stamps set. The lion is just so magestic! I began this project testing out some Chinese calligraphy paper that I had bought for collage work. I sprayed it with ink and then randomly ripped it up into strips and collaged these onto card using mat gel medium. I then used starlight paints to make some ink splaters for additional texture. This metallic paint is wonderful for this purpose. For the background behind the lion’s head I wanted to create an inky Maine . So using glossy card, I spayed some yellow ink and applied aquatint inks blowing the ink using a straw. I stamped the lion’s head and sentiments using black wow sparkle powder. I coloured the lion using Spectrun Nior sparkle pens. I had created a sun dial from air dry paper clay a while ago for another project and didn’t use it so I decided to colour it and gild it with pebeo wax and use it as an extra layer to emphasise the lion. I assembled the elements including the wording, layering it onto complimentary card. I also added some black thread and purple gems for additional interest. He’s a handsome devil isn’t he! Incredible project Lisa! It is so dramatic and powerful.. perfect for the mighty Lion! Have you seen our awesome NEW stamps and stencils? Head on over to our store to check them out! We will be back with more gorgeous inspiration tomorrow. On this very last day of April I am able to share something very exciting…. my very first DT project made using one of the brand new April stamp release sets from Visible Image. I have oooohhhed and ahhhed at this amazing new release and I will be sharing lots of makes with them over the coming weeks. If you would like to see the whole of the release do have a look here. There are 6 fab news stamp sets including some brilliant words set and also 8 gorgeous new stencils. They are all on pre-order so if you want to get your order in now they will be delivered to your door immediately after their release on May 11th. Your local stockists will also be receiving them very soon. Mr Hummingbird from the wonderful new Life is Beautiful set. 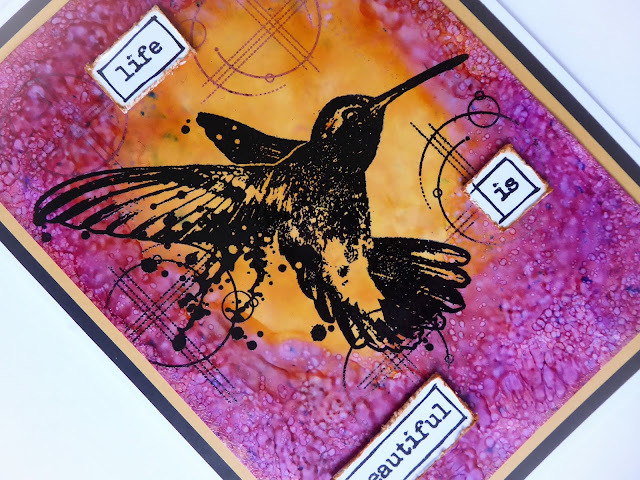 This gorgeous inky hummingbird stamp is certain to take the stamping world by storm. For my first make I wanted a very striking inky background. I took out my alcohol inks, from yellows through to amethyst and added them to Yupo paper using a felt and blending tool. I wanted a real glow behind him so I kept the centre fairly plain and used yellow and orange hues. This is a quick snap taken in my studio showing the gradual build up of ink on the Yupo paper. I kept my design fairly simple as I wanted the background to show off Mr Hummer. The words are as they say, just “beautiful”. I distressed the edges and added some ink to make them pop. The little circle accent stamp works so well with the image. I can see me using this a lot on other makes too. Here is one last full shot. I have been asked about ink not drying on Yupo paper on the Visible Image friends Facebook page. Yes it is a real challenge to get any ink to dry.. I have tried everything and the one which is most likely to dry is Ranger Archival if you heat set it. However I don’t like to take the risk and for this card I used Versafine Black Onyx ink which I then embossed with black embossing powder. This gives a gorgeous sheen too. HOWEVER beware when heating the Yupo as it is not that heat stable. You need to heat quickly and move your heat gun around and even off the paper so as not to risk melting your background. I hope that helps? Thanks so much for stopping by and for all your very kind comments. 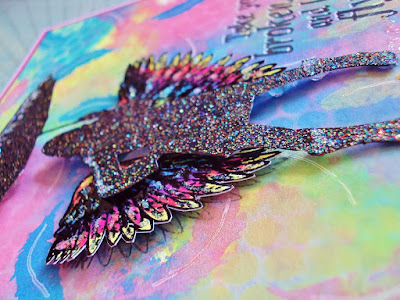 Wow your incredible background really sets off our gorgeous hummingbird stamp Jane! Such wonderfully vibrant colours ♡ Thank you Jane! Did you enter our Visible Image meets MISTI Blog Hop? You have a few more hours to get your entry in for a chance to WIN one of two fantastic prizes! More details HERE! 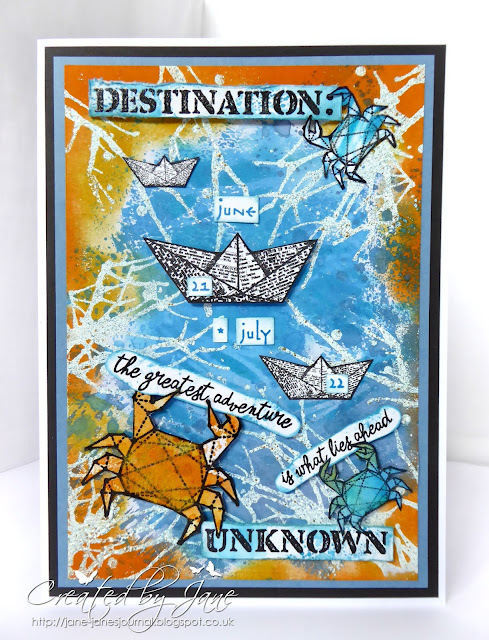 We will be back tomorrow with an awesome card by Lisa Taggart created with our Zodiac stamps! Hello! We are back with more fantastic inspiration today! We released our brilliant ‘Maskerade’ stamp set earlier this year, which includes the iconic Comedy and Tragedy Mask Stamps which are perfect for anyone studying performing arts, or who just loves the theatre. 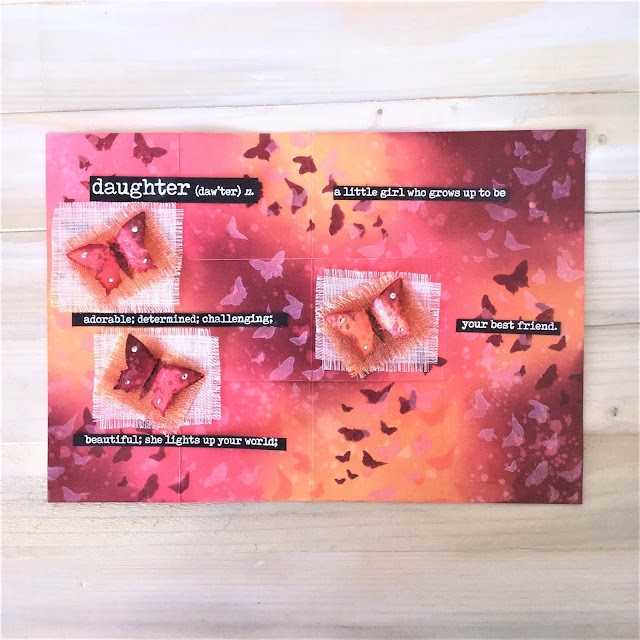 Sharon Traynor is here to share an awesome project featuring these stamps… and it just so happens that today our youngest daughter Katie received an offer for a place at an amazing theatre school in London!!! We are so proud of her! Hi! It’s lovely to see you here. 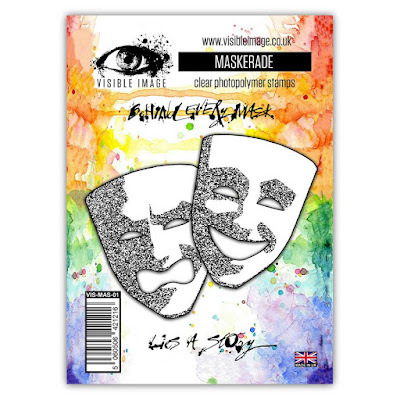 I was leafing through my Visible Image stamps the other week when the idea struck that the awesome Maskerade stamp set would make a fantastic Phantom of the Opera mask. Hmm…..but, how to use that idea? So the idea of a ticket wallet/gift card holder came to mind. 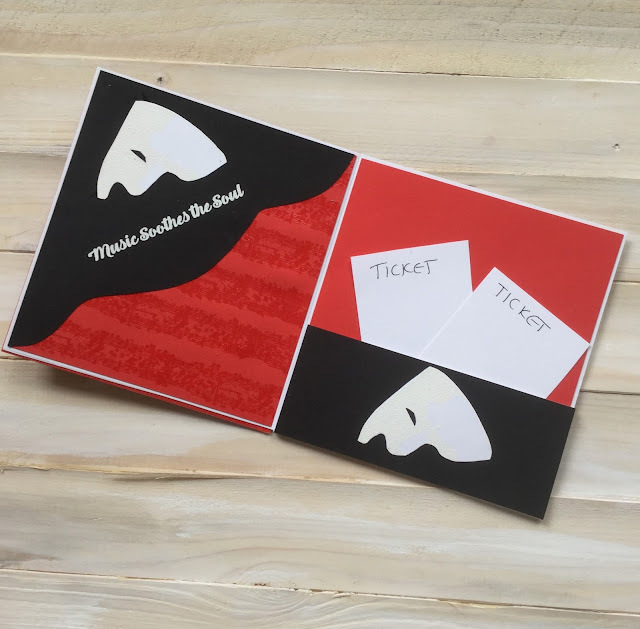 What a fab way to personalise a gift of theatre tickets for someone who loves the theatre (especially if they love musicals), or to pop a book token or film tickets into. I must say the Maskerade set is just perfect for all types of theatre/film or book buffs. I made a short video, in real time, to explain the scores and cuts for making the basic wallet card blank. You can watch it by CLICKING HERE. Stamp the ‘tragedy’ mask from the Maskerade stamp set in black ink onto red card and cut it out. Stamp this mask three times more in clear ink on white card and heat emboss with white embossing powder. Cut the eyes out of all pieces and cut the mouth out of the red mask with a craft knife. 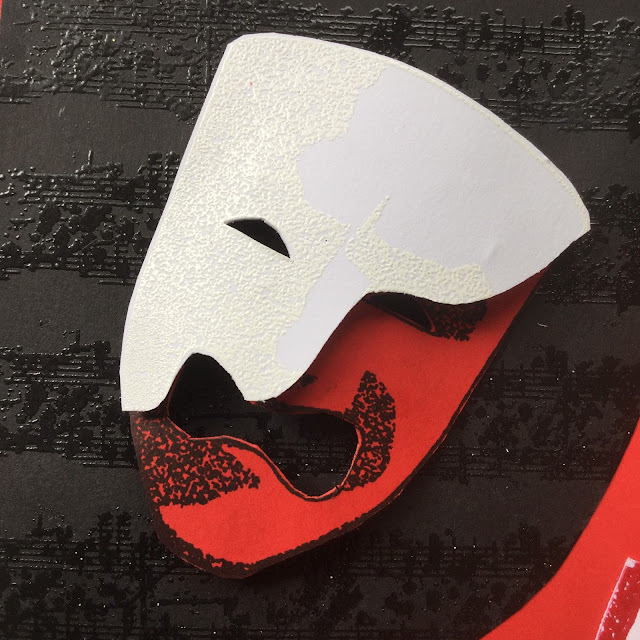 Cut the white masks freehand to a shape that resembles a phantom of the opera mask. Heat emboss the ‘music speaks’ guitar stamp from the Music Speaks set in red onto white card. Using a clear embossing pen, extend the guitar shape so that it is a square, making sure the letters stay visible, and heat emboss the pen marks with red embossing powder. Cut into a square. Clear emboss the music staves from the Music Speaks set onto a square piece of black card and cut this on the diagonal in a wavy line with a similar-ish shape to the phantom mask. Cut another piece of plain black card with the same wavy shape diagonal for the inside of the wallet, and then white heat emboss the sentiment onto that piece. Clear emboss the music staves onto a square piece of red card for the inside too. Add a square of plain red card to the right and side of the wallet, and add some black card to the pocket area. Attach one of the Phantom masks to the pocket. On the left hand side attach the clear embossed music stave red card, and add the plain black wavy cut card over it. Attach a phantom mask onto the black card. Glue a square of plain red card to the front of the wallet and add the clear embossed music stave black card to the upper left. Using a white opaque pen, doodle and write ‘phantom of the opera’ on the visible edges of the red card as shown. Attach the red mask onto the black card with 3d foam pads, then add the last white phantom mask over the top, again using 3d foam pads. 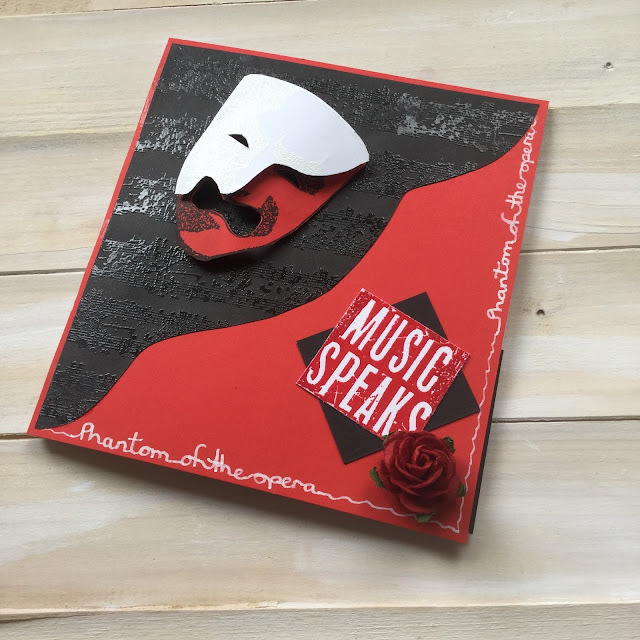 Finish with a black square of card behind the ‘music speaks’ embossed square, and add a paper rose to the bottom right corner. White card, red card, black card, Versafine onyx black ink, Versamark clear ink, WOW! Ultra bright white embossing powder, clear embossing powder, red embossing powder, versamark clear embossing pen, white opaque pen, red liner tape, 3d foam pads, paper rose, heat gun, scissors, glue. That’s it from me for now. Thanks for stopping by and I really hope to see you again soon. We love love love this Sharon! 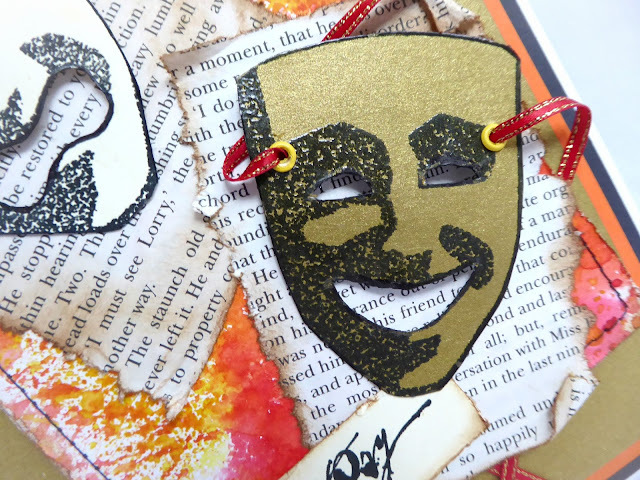 Superb idea and a great way to use these mask stamps! You will find more of Sharon’s wonderful cards and projects over on her blog. Tomorrow we have a fabulous blog hop with our friends at My Sweet Petunia.. creator of the MISTI! There are 2 amazing prizes on offer so make sure you stop by for all the details tomorrow. See you tomorrow for a fabulous and fun filled Friday! Today it is my turn to share & hopefully inspire you over on the Visible Image! So I thought I would play a bit in my Art Journal, which really is an old book that I picked up at a resale shop. The book is so old the pages are discolored and they easily tear. But its the perfect size and as a bonus the text makes a great background. Anyhow… Back to my page after a quick layer of gesso, a few dabs of paint and a bit of stamping this page came together in a flash and it was the perfect mojo pick me up! Other Products Used: Prima Heavy White Gesso, Prima Watercolor Pencils. Finnabair Art Alchemy Impasto Paint. Versa Ink Pad & Versa Fine Black Ink Pad. Lindys Stamp Gang Purley White Embossing Powder. Ranger Ink Pads-Electric Lime & Caribbean Coast. Now lets take a closer look at my page…. I stamped this with a Versa Mark Ink pad and embossed it with a bit of Lindys Powder. Then I added lots of doodles with a white Uniball Pen. Here’s a better look a a bit of the stamping that I added to the background with the fun Ink Splats Set! 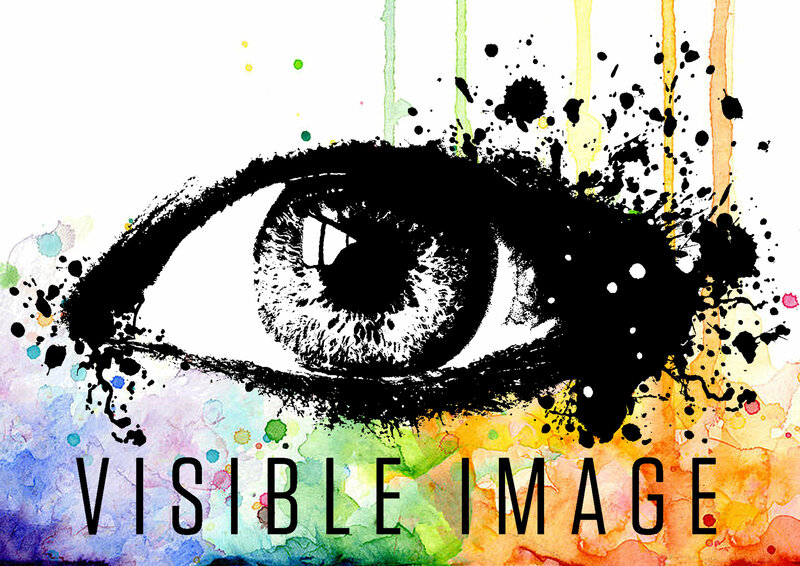 Now make sure you stop by and join the fun over in our Visible Image Facebook Group! Stay tuned in we have lots more amazing things coming up for you soon! 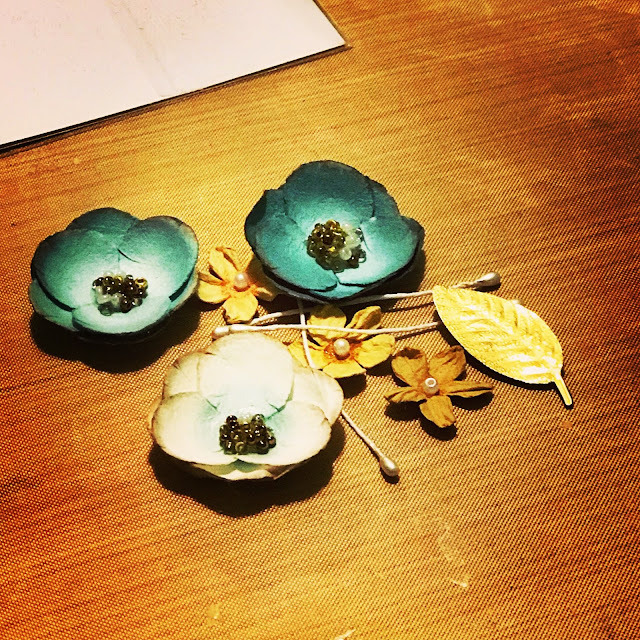 You will find more of Lanette’s amazing projects over on her blog. We’ll be back tomorrow with a very theatrical project from Sharon Traynor! Happy Tuesday and hope all is well!! 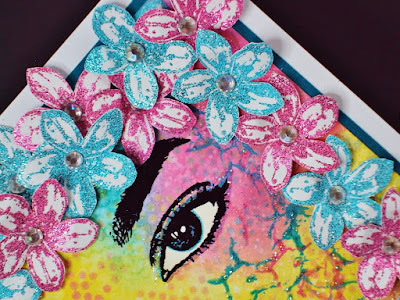 You will find more of Tenia’s awesome cards over on her blog. 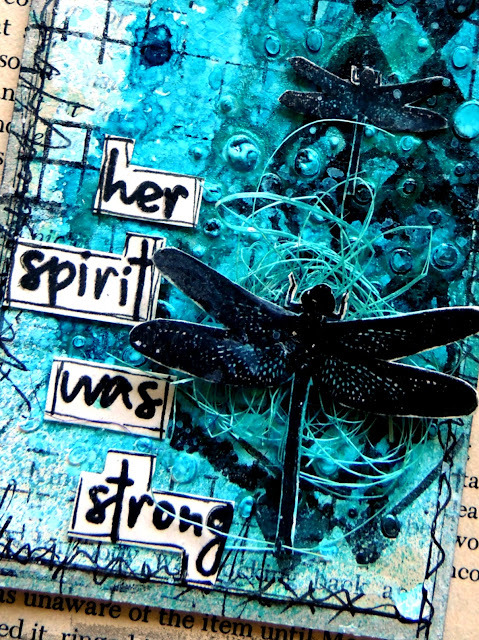 We’ll be back later with a fabulous journal page from Lanette Erickson! My card was published in the March edition of Craft Stamper magazine.I made a “baby plant” card! The background is a blend of green distress inks. This is such a unique baby set, and the words work so well with other stamps too. We will be back tomorrow with another fantastic card, created with our awesome stamps! It won’t be long now until we start to reveal our NEW stamps and stencils.. we have a feeling you are going to LOVE them! Hi there! We are back with our final dose of LOVE -ly inspiration for today. Hohoho… Merry… wait… what? Finally the sun is coming and snow is the last thing on my mind right now. But… I did indeed take out my Christmas stamps to make a card today ^.^ But that’s only because this set is just perfect for so many more occasions then only Christmas projects. 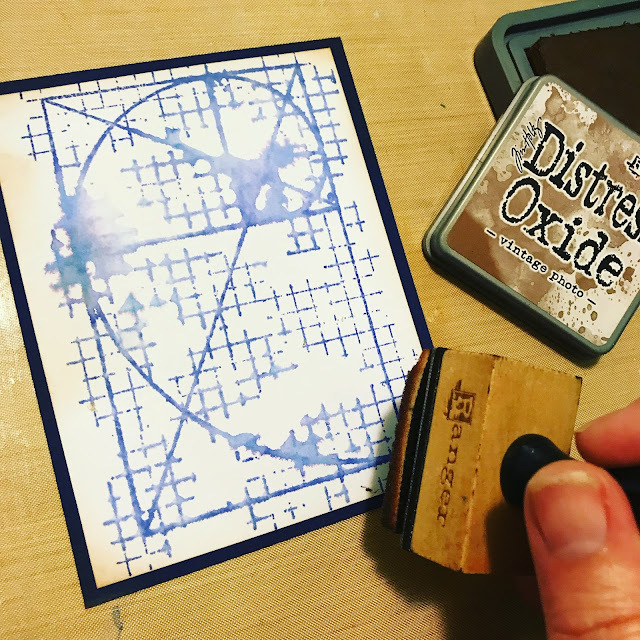 I really wanted to make a card to send some love over to someone, so the choice to use the word LOVE was obvious, now to build up the rest of the card… I just took my box of Visible Image stamps and looked at each set to find tiny elements that I could bring together. And I ended up with four of them in total for my background. I firmly believe you should tell anyone that you hold dear you love them. Believe me, you can stay behind alone in a blink of an eye and then it’s to late. So who do you want to tell you love him or her today? What is holding you back…tomorrow is never promised. We will be back tomorrow with a whole new week of inspiration from our amazing team! We also have some exciting NEW stamps and stencils coming very soon… keep your eyes out for sneak peeks!! 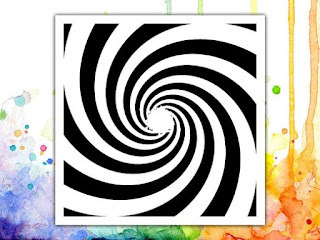 Did you know that Visible Image have some fabulous background stamps to compliment their feature sets? In today’s post I wanted to celebrate these stamps and show what wonderful texture they can create. To begin the project, like I seem to do most days I used a gelli print background from my stash as a starting base. This was created using Golden high flow acrylic paint. I stencilled over it and built up the background gradually, using distress ink (including oxides) and the background stamps. 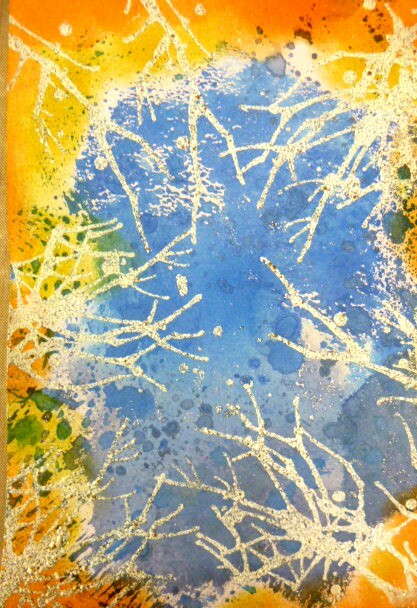 I then then flicked some blue, white and gold ink on top. When dry I added another layer of stamping. Having printed my feathers I used the stamps to stamp on top of these. I then used the feature set to stamp the butterflies on to scrap card. When cut out I added them along with the sentiment and hearts. I also did some doodling and added highlights with acrylic pens including gold pen. Finally for additional texture I cut up some floristry mesh,adhered gems to the butterflies and attached some black and blue bakers twine. I think this is one of my favourites. I hope you like it too! We have one final post today, so hope you will pop back a little later to see a beautiful clean and simple card from Veerle. We love how our Design Team show all the possibilities with our stamps.. from highly detailed mixed media pieces to stunning clean cards.. whatever your style our stamps will work for you! Mother’s Day is coming on the horizon and I’m thinking about how to make my mom cry. She had a good deal of that go on in my youth – but these days I try to make her cry for much different reason . Hehe! So when I got my hands on the Visible Image Mother Definition stamp, I just fell in love because I knew for sure I could make my momma cry. When I was thinking about the card, the bone china with the bright blue patterns sprang right to mind and I wanted to re-create that feel. I took the Fibonacci background stamp and inked it up with some bright blue Distress Inks on my Misti. I spritzed it with water from a small bottle, and then stamped. As you can see, it created this perfectly imperfect background, which I mounted on dark blue cardstock to base it, and then sponged around the outside edges with some brown Distress Oxides. It’s been awhile since I used paper flowers to create a cohesive design, but in this case, I knew it was just the thing. After I embossed the sentiment, I added different layers of flowers and gold leaves, sprinkling everything with a layer of Distress Spray Stains. In the end, I completely adored the card and know it will make some woman very special and happy. 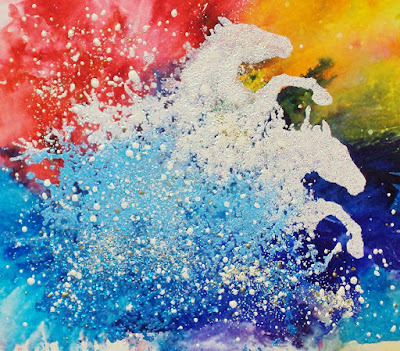 We will be back a little later with an stunning canvas from Jane Tyrrell. Hello! We are back with more gorgeous inspiration today, as promised. I hope you are enjoying the few tropical days we’ve had this week, may it long continue…. My Visible Image share this week, is a tribute to Katie, who had an audition this week to hopefully start a long and happy career on the stage, she gets her final results in two weeks time….. so, as she loves singing, I thought I’d use the fabulous ‘Sing‘ set of stamps, along with the ‘Time Tunnel‘ stencil. My background was achieved by placing the stencil onto some smooth water colour card, tapping some Lemon Brusho over it, and spritzing with water, then lifting off the stencil, and washing it, I left the card to dry naturally. I then placed the stencil back onto to the dry card, but rotating it slightly, so the bare card is showing through the openings, (not the Lemon colour), then tapping a combination of Rose Red and Turquoise Brusho over it, spritzing with water again, then lifting off the stencil, and leaving the card to dry. On the lower half of my background card I sprinkled some Ultramarine Brusho, along with Yellow, Blue and Pink Pixie Powders, spritzed with water, and held the card up to drip down, mopping up where necessary, again leave to dry. I then stamped and heat embossed the singer, with Black Embossing powder, and also stamped and heat embossed the music bars with Florescent Pink Embossing Powder. Taking some Silver paint, I dry brushed all around the singer, and grounded her. On a separate piece of white card, I stamped the Singer again, and heat embossed her, using Black embossing powder, and fussy cut her, gluing her over the image already on the background card, using some 3D glue gel. I stamped and heat embossed the sentiments, onto some pink card, using Black Embossing Powder, fussy cut them too, and added them to the card, again using 3d Glue gel. Thank you so much Pauline.. Katie loves it! We will be back later with some truly amazing inspiration from our team! Hope you’ll come back and check it out..
Hello! We are back with more gorgeous inspiration this evening. Sharon Traynor has a fabulous CAS card for you today. What a wonderfully positive and uplifting sentiment that is. This fab New Beginnings sentiment from Visible Image stamps was one of the ones that I couldn’t wait to use as soon as it came through my craft room door, and I knew it would be a perfect match for the closed eyes in their Face It! set too. Face It! is a set that I have had for a little while now, and I have been itching to ‘bling’ it like all those amazing glittery eye shadows that you see, but I had to wait until this sentiment arrived. Distress marker spritzing is one of my favourite techniques because it is a clean way to achieve the brusho look without having dyed hands for days. Maybe that’s just me – I love brushos but I do end up covered in them. Anyway, distress marker spritzing is a technique that I really don’t use enough. 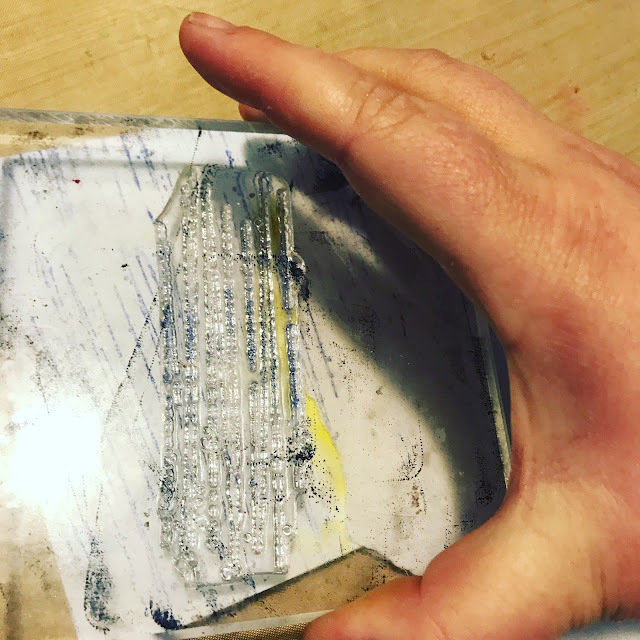 Using distress markers and the distress marker spritzer, spritz a band of colour horizontally along the centre of a piece of card measuring 13.5cmx20cm (5.5″x8″), using first the tumbled glass marker and follow that with the salty ocean marker. Using black ink, stamp the closed eyes onto the spritzed band. Stamp the first two lines of the sentiment above the eyes, then the last two lines of the sentiment below the eyes. Use a post-it note to mask off the lines that you do not want to stamp, and remove the post-it note before stamping. 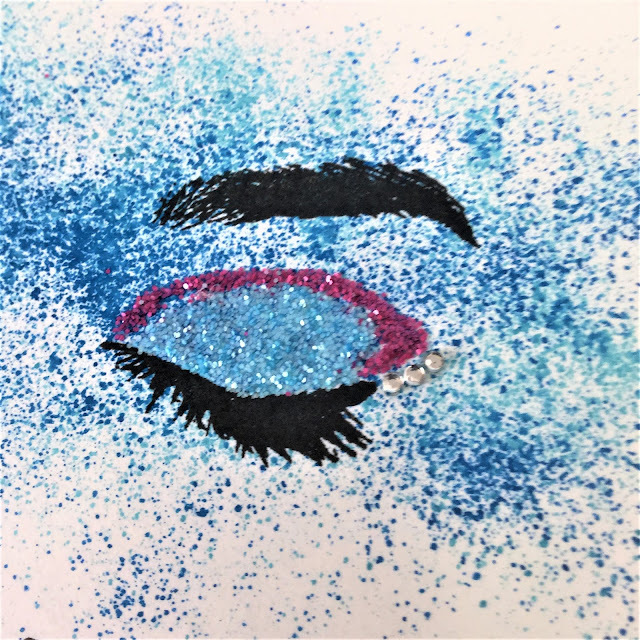 Once the ink is dry, draw a line with glue to mark the area where the lower part of the eye lid meets the upper part of the eyelid. Sprinkle picked raspberry distress glitter over the glue and set aside to dry. Once dry, add glue to the lower lid and sprinkle with tumbled glass distress glitter and set aside to dry again. TIP: If you are sending something glittery to someone that doesn’t like the way that glitter sheds, you can always use glossy accents to keep the glitter in place. 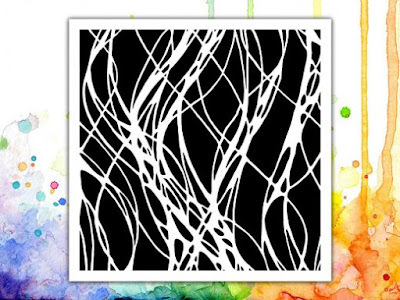 Mount the panel on an A5 card blank (14.8cmx21.1cm or 5.75″x8.25″) with fun foam. The finishing touch is to add 3 tiny gems at the side of each eye to represent glittery eye liner. White card, Tim Holtz distress marker spritzer, distress markers (tumbled glass, salty ocean), versafine onyx black ink, post-it note, stamping platform or stamping blocks, glue, distress glitter (picked raspberry, tumbled glass), fun foam, tiny clear gems. That’s it from me for today. Thank you for coming to visit and I really hope to see you again soon. You will find more of Sharon’s wonderful cards over on her blog. 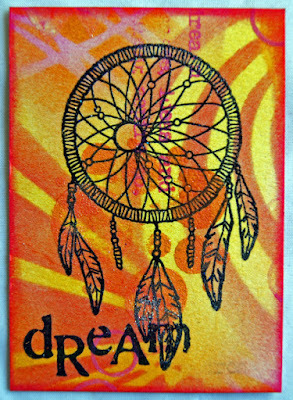 We’ll be back tomorrow with more brilliant inspiration created with our stamps and stencils! Elisa here with my latest mixed media project for you. To create the tag, I started with a heavy base chipboard tag from 2Crafty Chipboard, perfect substrate for a mixed media tag. Next came a background of gesso’d old book paper, torn and distressed. 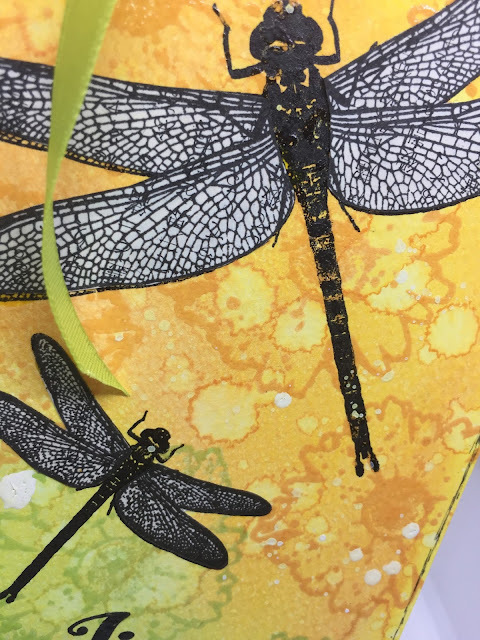 I then stamped my feature dragon flies, hand coloured with a bit of the gorgeous teal dylusions shimmer spray, and then fussy cut them out and 3d mounted them over my background. I loved using the Cosmic Skies Stencil to create a small and subtle amount of texture for my background. I used a white modelling paste as I find that it doesn’t soak up colour as much as other mediums leaving you with bright colour! That’s it from me today, make sure you leave me some love! You will find more of Elisa’s awesome projects over on her blog. Facebook group – see all our Design Team projects first! Enter our Monthly Challenge! Make sure you show us what YOU have created with our stamps/stencils by uploading your photos in our Facebook group! Add them to the ‘Show and Tell’ album for your chance to WIN a £25 coupon! We will be back soon with more fabulous inspiration! Hello! We have even more awesome inspiration coming your way here on the blog today! The design also appears on the introductory page of the Visible Image catalogue. 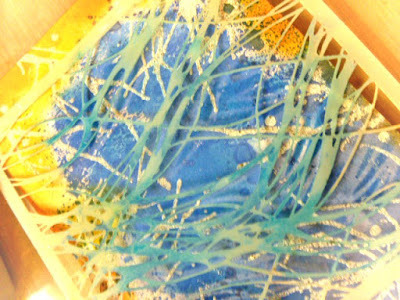 I wanted to create a multi layered piece to give the impression of an underwater mirky depth. I did this using a variety of mediums and masking tricks. I masked using a combination of heat resist embossing for the sea horse and some of the foilage and fluid masking through the stencil. When colouring I used a combination of brusho powders, Spectrum Noir sparkle pens and acrylic paint. To create dimension and light I payed particular attention to the placement of the dark and light colours both for the foilage and the background water. I also concentrated a fair bit on the finer details- the colouring of the seahorses, gelli fish and the bubbles. I decided to use the reverse of the canvas to create a box frame. I used texture paste through the stencil and embedded art stones for extra bubble like texture. I wanted to mirror the scene inside the frame. I painted the inside of the frame using the aqua colour to reflect the light and highlighted the stones using gilding wax and glitter kiss. Finally the rusty wire around the frame as well as adding texture in a similar shape to the stencil it also depicted a metaphoric contrast- the calm scene as against life’s stresses on the surface. We’ll be back tomorrow with more gorgeous inspiration. Good Evening! Wow it has been nearly 2 weeks since we have blogged… so sorry! We have been so busy finalising NEW stamp and stencil designs, and orders have been incredible too! There are only so many hours in the day so something had to give… hopefully though, if you are a member of our Facebook group, you will have already seen some of the latest cards and projects our Design Team have created. If not, come and join us there… and show us what you have created with our stamps and stencils too! The card I am sharing today uses the fab Maskerade stamp set from the February 2018 release. I made it for Craft Stamper’s March edition, you might have spotted it in print.. and I can now share a few details. I wanted a piece of inky card for the background and used these distress colours. I stitched round the outside with my sewiing machine. 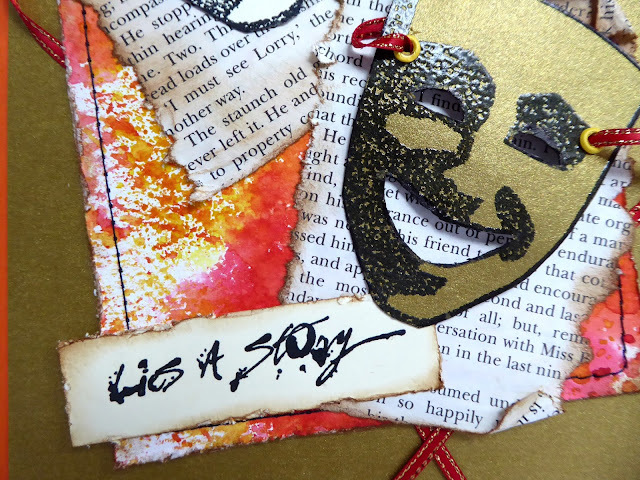 I stamped the happy mask on gold and the sad on cream card and fussy cut them out. I decided to make mine into “real” masks using ribbons and eyelets. 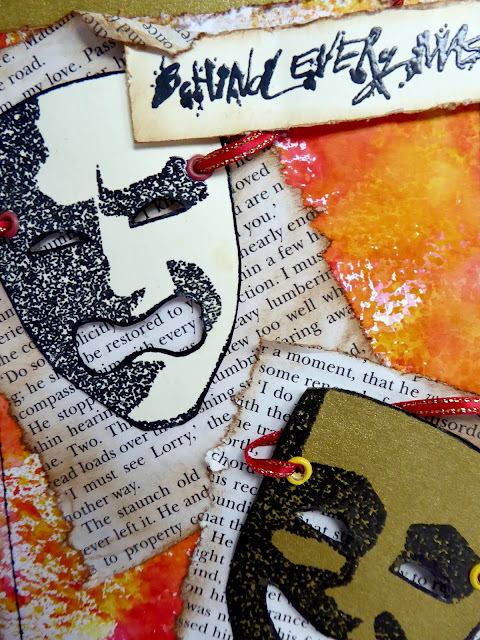 And then put together my card..
And if you are interested to know which “story” is behind my masks they are pages from Charles Dicken’s “A tale of two cities”. My Hb gave me an old copy he no longer needed and I use it lots in my crafting. Make sure you tag us in your posts! We will be back a little later with more awesome inspiration! Good Evening! Thank you for visiting our blog today. And it isn’t very hard to make a project using these words. Visible Image has enough stamps that match these words AND the little reminder I want to give myself. Choosing the colors wasn’t hard either… this project needed black and white. And then this little tiny red heart…at the end of a very fine root of the tree. If you have missed any of our recent posts, check them out HERE! We will be back later with an awesome card from Heather Mitchell. Hi everyone, today I want to share some Artist Trading Cards that I have made for the Visible Image Design Team. I have made four cards, measuring 2.5 in x 3.5 in. I began with a piece of watercolour hot pressed paper that is 300 gsm. Again using the same colours I have stamped randomly with a mixture of stamps that I have listed and linked to the Visible Image store at the bottom of the blog. I have then cut the paper into the 2.5 x 3.5 inches and stamped the focal point with black ink and used a sparkle embossing powder over the top. The big words were stamped with blank ink. 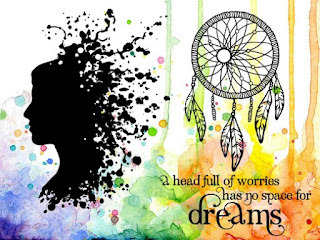 These are fantastic Lynn.. loving those backgrounds! Hello! We have more fabulous inspiration here on the blog today. The Background is created with Fluid Acrylic paints, added to the card with a palette knife. I then stamped the ‘Jumping Girl’ using Versamark, and heat embossed it with black embossing powder. I did the same with the stars, after adding the feathers, which were heat embossed with some Florescent Green embossing powder. I made the straight lines with a ruler and a black pen. 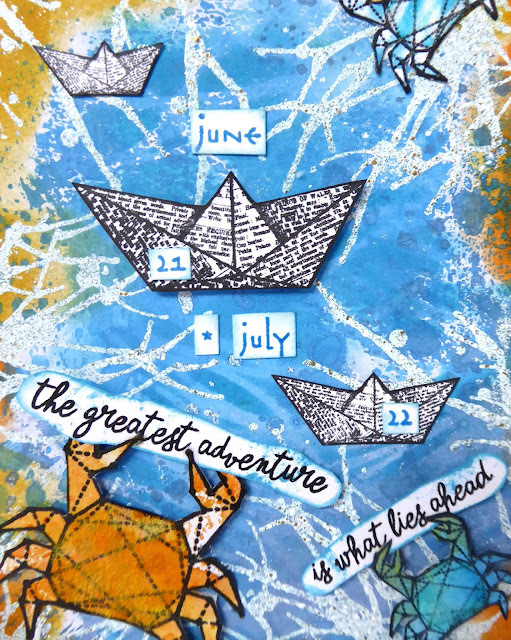 On a separate piece of card, I stamped the little boat, plane, and the sentiments I wanted (all from Destination Unknown), and fussy cut them, and added them to the card. Thank you so much for popping in. We will be back later with some awesome ATCs from Lynn! Hello! We are back with yet more fabulous inspiration this Bank Holiday weekend! Woohoo, I received a new package from Visible Image and just had to play with some of the ‘new to me’ stamps. One of them was the ‘she wears her smile as a disguise’ sentiment that just resonated with me. Those types of sayings allow me to get my creative thoughts flowing in a totally different way and usually I’m really surprised with the end result. Same here. That art journal page turned out very differently than I originally thought and I think it fits to that sentiment very well. First off, I created the background. This is actually a clean of page from a different project. I sprayed three different Dylusions spray colors onto a canvas and used these pages to press that canvas onto. I let the inks dry naturally over night. The background needed more texture so I sprayed water through the Cosmic Skies stencil and lifted the ink off the page. Dylusions sprays are never permanent, so it’s easy to create ghosting techniques like these with them. Next up, I needed my “she”. I found her in a magazine. Before adhering her to the page, I sprayed an aura using one of the new Shimmer Sprays from Dylusions. Then I adhered her down and added white gesso on top of her clothes. That allowed me to color her using the Liquitex paint pens. The trick to making it look okay is to sketch over it with a black and/ or white pen once done coloring. The top left corner was too white, so I added a few stars using the Stars & Stripes stencil with the same ink colors. Then I ripped a piece of cardboard to a good size, so the sentiment would fit on top. I stamped the sentiment onto a piece of white card stock and distressed the edges of the paper. Then I adhered both together and onto the page. 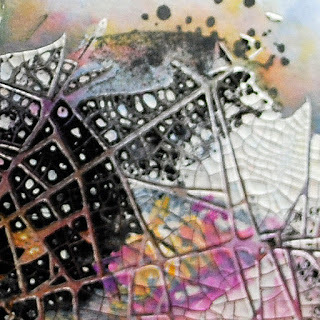 This grungy tag needed a little more, so I stamped the moth from the Glimmer of Light stamp set onto a piece of card stock and sprayed more Shimmer Spray on top. Then I fuzzy cut it and adhered it to the tag. I thought that the design of the moth fits perfectly and that the happy colors match the struggle that she feels. At the end I wanted to add a few more things to the page. 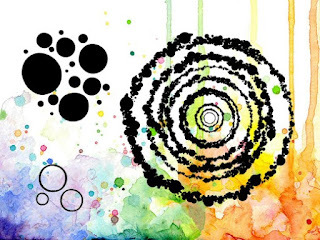 I grabbed a few leftover monoprint pages and die cut circles in three different sizes. I adhered those to the page and doodled a little bit on top and around “her”. I totally like how this page turned out and the message that it conveys. Dealing with depression, which for me is what this stamp is about, is not an easy life. I don’t want to go into details, but I know what it is talking about and the struggle that comes with it. Knowing that I have the possibility to relax through art and express myself with it helps tremendously though. You will find more of Josefine’s awesome projects over on her blog. 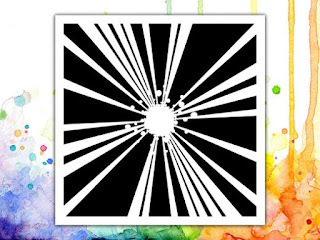 Make sure you show us what YOU have created with our stamps & stencils by uploading your photos in our Facebook group! Add them to the ‘Show and Tell’ album for your chance to WIN a £25 coupon! We will be back soon with a fabulous card from Pauline, and some brilliant ATCs from Lynn! Hi there! We are back with more beautiful inspiration here on the blog today. Are you like me? 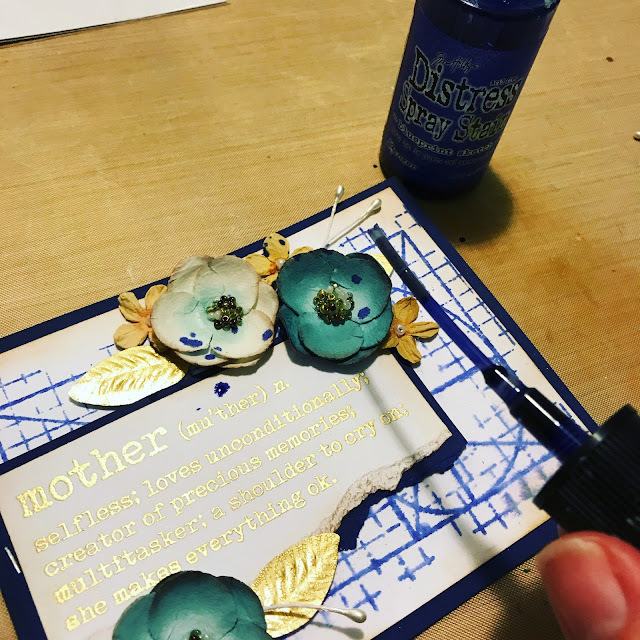 You know exactly what card making style suits you, but you simply have to try something totally opposite every now and then? That was me last week. So, I had a play with a couple of my fantastic Visible Image stamps and the urge to get all inky again got the better of me. My crafty session ended up with 2 cards using the same fabulous stamps and inks, but created with 2 completely different styles. One CAS and one full-on inky. 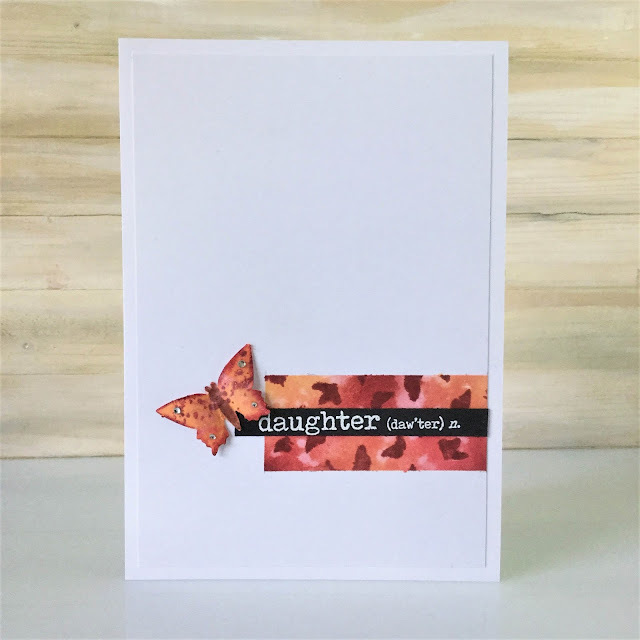 This daughter definition stamp is absolutely wonderful in the beautiful words it uses – I especially love the phrase about a daughter being a little girl who grows up to be your best friend.It is also a perfect sentiment stamp to use for the thin, white embossing on black card sentiment style that seems to be the ‘in-thing’ at the moment. Actually, any of the Visible Image Definition stamps would be perfect for this style. Anyway, I decided to make a shutter card, so above you can see it partially opened, and here is what it looks like from front on when it is standing up. Take a piece of card 26cm x 18cm and ink blend a background with the 3 distress inks listed below. Flick some water onto the background and dry it. Then randomly stamp the kaleidoscope of butterflies stamp (isn’t that a wonderful definition of a group of butterflies? a kaleidoscope) in aged mahogany and worn lipstick distress inks as well as worn lipstick distress oxide. TIP: If the back of the card gets inky, you could colour it with the distress oxide and randomly stamp the butterflies on that to make it all co-ordinate. However, if you are using a lighter weight card, it may become flexible and have trouble standing up. If that happens, you may need to glue some white card on the back to fit over your inking instead. 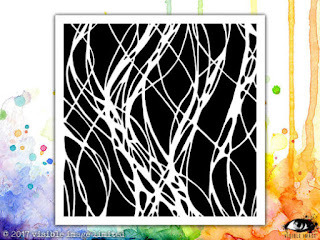 Heat emboss the sentiment in white onto black card and cut it into each individual line. Once the shutter card has been cut and scored, glue the slivers of sentiment as shown above. the ‘daughter (daw’ter) n.’ and ‘beautiful; she lights up your world;’ are only attached on the beginning half of their length. the ‘a little girl who grows up to be’ is positioned so that it is hidden by ‘daughter (daw’ter) n.’ when the card is closed. Ink up another spare piece of card in the same colours as the background and randomly stamp the ‘splattery bits’ from the large butterfly from the Live Life Now set across it. Punch out (or die cut) 3 butterflies from that piece of card. Add a little aged mahogany to their wing edges, and draw in a body in the same colour, then cover them with distress stickle for a sugary sparkle. Once that is dry adhere some clear gems onto their wings. Take some linen-type material and ink part of it in dried marigold with a hint of aged mahogany, and leave the other part un-inked. Cut 3 pieces of un-inked material, and 3 smaller pieces in the inked material and fray each edge. Adhere these, and the butterflies to the card in layers with glossy accents as shown above. For the CAS card, mask off where you want the inky panel to be and blend the distress inks into it. Spritz water onto the panel, then stamp the butterflies in aged mahogany, and then remove the masking. Heat emboss the first line of the daughter definition sentiment in white embossing powder onto black cardstock and adhere over the inky panel. Attach the whole panel to the front of a card blank and then add the butterfly (made as above in the shutter card). Finally stamp the whole of the daughter definition onto the inside of the card in black ink. 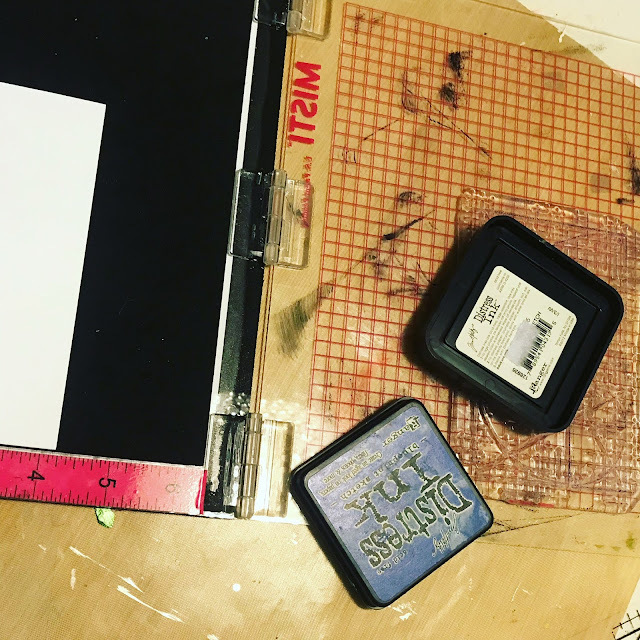 White cardstock, Blending tools, Distress Ink (aged mahogany, worn lipstick, dried marigold) Distress Oxide (worn lipstick), Ruler, Pencil, Craft Knife, Black Card, Anti-static pad, Versamark Clear Ink, Wow! Opaque Bright White Super Fine Embossing Powder, Heat Gun, Butterfly Punch, Distress Marker (aged Mahogany) White Linen, Distress Stickles, Gems, Glossy Accents. Thanks for stopping by. I hope you like my cards, and I really hope to see you again soon. These cards are so beautiful Sharon.. love how different they are, yet equally as elegant as each other. You will find more of Sharon’s gorgeous cards over on her blog. Follow Sharon’s YouTube channel for more wonderful inspiration! 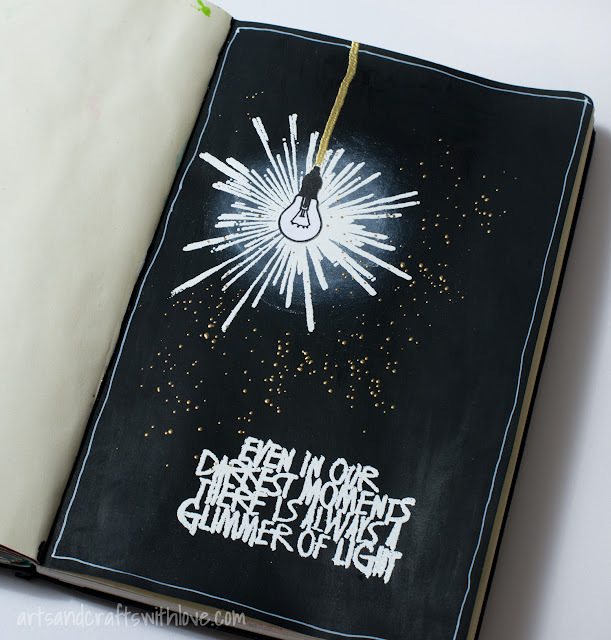 We’ll be back later with a fabulous journal page from Josefine! Hello and Happy Easter! We hope you are enjoying a break from routine, and spending time with your favourite people. We are taking a couple of days off, enjoying some family time (and eating a little bit too much chocolate! ), before the madness of the Ally Pally craft show preparation starts on Tuesday!! Today it is my turn to share & hopefully inspire you here on the Visible Image Blog, and I just had to create something with this Dragonfly. So, I decided that I would create a layered tag with him as the star of the show! 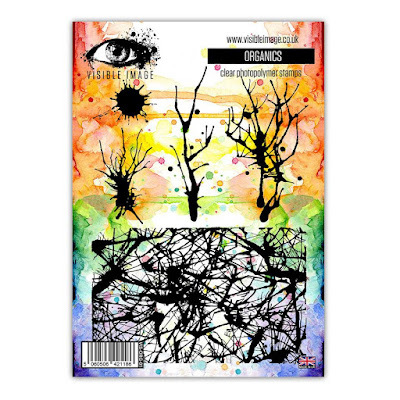 Products Used: Visible Image Stamp Sets- Imagine Dream Inspire, De-Stressed, Ink Splats & Live in the Moment. Lindys Stamp Gang Sprays- Rusty Lantern Lime, Bells of Ireland Green, Green with Envy Green & Luminous Yellow. Art Anthology Sorbet- Cayman & Tink. Ranger- Electric Lime & Caribbean Coast Ink Pads. Versa Mark Black Ink. White Uniball pen. Ranger Glossy Accents. Misc Ribbon. Prima- Watercolor Paper. Wafer-Thin Umbrella Dies. Now lets take a close look at my tag…. 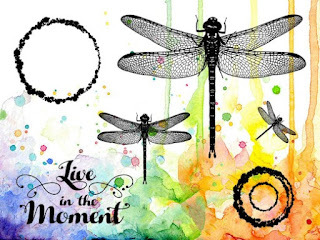 I just love the Dragonfly in the ” Live in the Moment Stamp Set” he is absolutely beautiful! So I had to fussy cut him to really make him POP. I also stamped directly on the tag too. 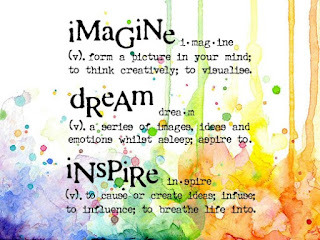 Here you get better look at the titles that from the “Dream Inspire Imagine Stamp Set” While I love the definitions in this set, I really only wanted the bold titles for this tag. So with just a bit of selective inking I had my bold words. If you look closely, you will see there really is a lot going on in the background of my tag. I used both the De-Stressed & Ink Splats Background Stamp Sets. We’ll be back later with 2 beautiful cards from Sharon Traynor. Good Evening! Hope you are having a good week so far. I am here to share my weekly Design Team project for Visible Image stamps. This week I am sharing a make inspired by my sweetest cat Billy. He has shared our home for nearly 10 years now and is just the dearest, most gentle cat you could meet. In the winter you will find him on his favourite green chair. He is very timid of strangers and never really strays further than our back garden in the summer. One thing all cats love are boxes and yes Billy has his own one where he often takes a cat nap when it’s a bit chilly. My make today uses the brilliant Curious Cats set of stamps.. I made an inky background using distress ink and then stamped “Billy’s” face. I coloured his eyes and nose with a gel pen. I added glossy accents to his eyes and nose to give them real cat like sparkle. I cut a piece of cardboard packaging to make the surround and stamped the sentiment and paw prints which come in this set. I cut a hole and then slits in the cardboard and then folded them back and stuck them down to form flaps. ha ha….Billy in the dark? I used white embossing powder for this.. This is such a fab set of stamps! such a funny boy and yes he even loves light boxes! Thanks for stopping by and for all your very kind comments you take the time to leave me. The sunshine returned last week and Billy and I are loved it. We have even managed some cuppas in the garden. However there are threats that the Beast might be back for a 3rd visit next weekend… I really hope not as that it a very special weekend for me and I have plans! LOVE this card Jane… such a fantastic idea to have the cat peaking out! Here at Visible Image I have a little something to brighten your day, I hope! 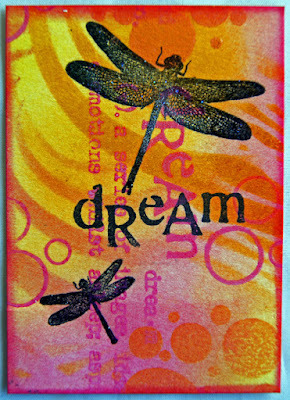 This mixed media piece combines stencilling leftovers; sparkly texture paste; stamping and frantage. What more could you want !! I began using a piece of card where I had blotted ink off my strobe stencil when using it for another project . I love left overs. Actually sometimes I prefer them! I thought my scrap inked card would look nice with some sparkly texture paste on top. Next I stamped and embossed some flowers, stems and sentiment using black sparkle embossing powder. I experimented a bit adding some frantage fragments as texture and some black micro beads after the flowers were cut out. I also stamped onto inked scrap card for added interest and intensified the colour using my Spectrum Noir acohol markers. The morale of this story is never throw away your interesting scraps! Also a little texture can breathe life into any project. We’ll be back tomorrow with more fabulous inspiration. Hello and Happy Monday to you! We hope you had a lovely weekend. All those creative ideas in my head… Some of them are just things I’m really looking forward in creating so I’m sure I will not forget them. And then there are those tiny details I think about… I just might forget about those so I write them down. Years ago on tiny little papers and I had heaps of them laying all around in the house. But I got tired of them so decided to make my own traveler’s notebook. I bought a piece of leather and some notebooks, cut it all to the size I wanted and I was ready. We will be back a little later with a beautiful and rather magical card from Jane Tyrrell! Tag us in your posts!! And make sure you show us what YOU have created with our stamps/stencils by uploading your photos in our Facebook group! Add them to the ‘Show and Tell’ album for your chance to WIN a £25 coupon! We will be back a little later with a gorgeous layout from Lynn, and something new from Veerle too! Today is Fabulous Friday, so time for me to share a card I’ve created, using some awesome Visible Image products. The background was achieved by stippling Red, Yellow and White paint together onto the card, I then placed the Time Tunnel stencil on top, and stippled through it with yellow paint. I made some highlighting lines with a white pen, on top of that, I added the Geometric stencil, and stippled through it with Gold paint. I added red paint with a brush, for the floor. Next I stamped the feather, using an embossing pad, and heat embossed it with Totally Teal Embossing Powder, I then stamped the ballerina again with an embossing pad, and heat embossed her using Black powder. I used stickles and Liquid Pearls to colour the ballerina’s dress. I stamped the stars and the sentiment, and heat embossed them with Back embossing powder, and to finish off, I went around everything with a white pigment pen. If you get the chance to attend one of Pauline’s inky workshops, you really must… !!! We will be back tomorrow with gorgeous inspiration from Josefine and Lynn! Today it is my turn to share & hopefully inspire you over on the Visible Image Blog. So I thought I would share a bright and cheerful tag with a splash of spring spirit. Products Used: Visible Image- Smile Sparkle Shine Stamp, Visible Image -Own Kind of Beautiful Stamp Set. Lindy Stamp Gang Sprays. Versa Mark Ink. Prima Watercolor Paper. Misc Ribbon. White Uniball Pen. 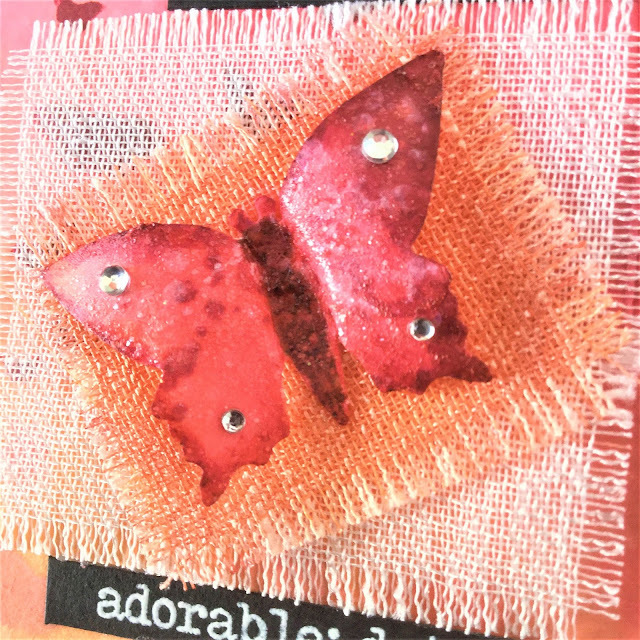 A couple fussy cut butterflies add just the right touch of spring to my bright little tag. Fabulous tag Lanette.. loving those bright, happy colours! We’ll be back tomorrow with a beautiful CAS card from Sharon Traynor ! If you have missed any of our recent posts you will find them HERE! If I Could Turn Back Time.. If you could turn back time… how would today look like? Would it be the same, or would you change things in the past that makes today could look completely different. But be careful… it’s not only the bad things that change… your changes might just have its influence on the good things you have today too. 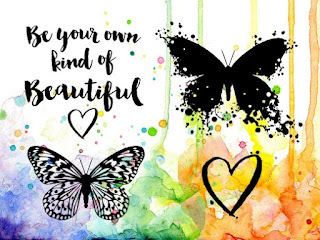 This beautiful butterfly and those thoughtful words are Visible Image stamps. And the coloring is a combination of Derwent Inktense and my beloved watercolors. You’ll find more amazing projects over on Veerle’s blog. We will be back tomorrow with a brand new project from Jane Tyrrell! Hi there! Hope you are having a great weekend. ‘Happy Mother’s Day’ to all the awesome Mums out there.. hope you get some YOU TIME today! We have another fantastic card to inspire you here on the blog today. March in North Dakota usually means blustery snow and cold. But this week, right before we got walloped by a blizzard, there was a thunderstorm and tons of rain! 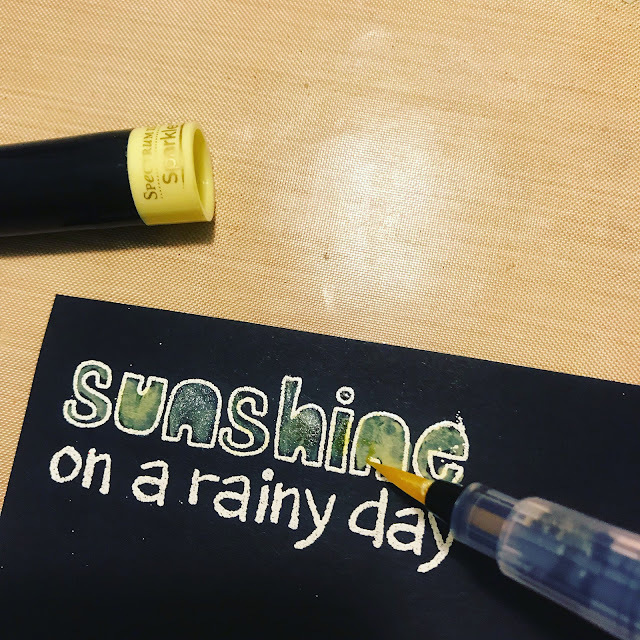 In honor of our rainstorm, I busted out the Sparkle in the Rain stamp set by Visible Image and let my inner optimist shine with this card design. 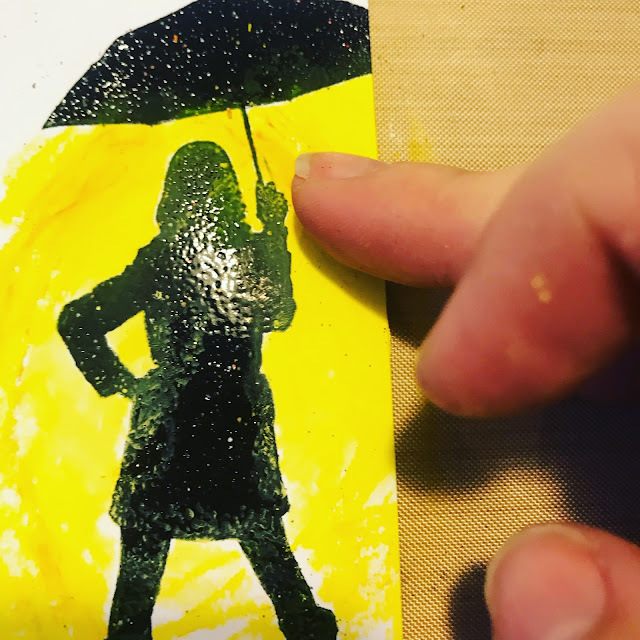 I began by embossing the umbrella girl in black and then scribbled over her with shades of yellow gelatos. I blended the gelatos with my fingers and then used a damp paper towel to wipe off the excess gelato from the embossed image. 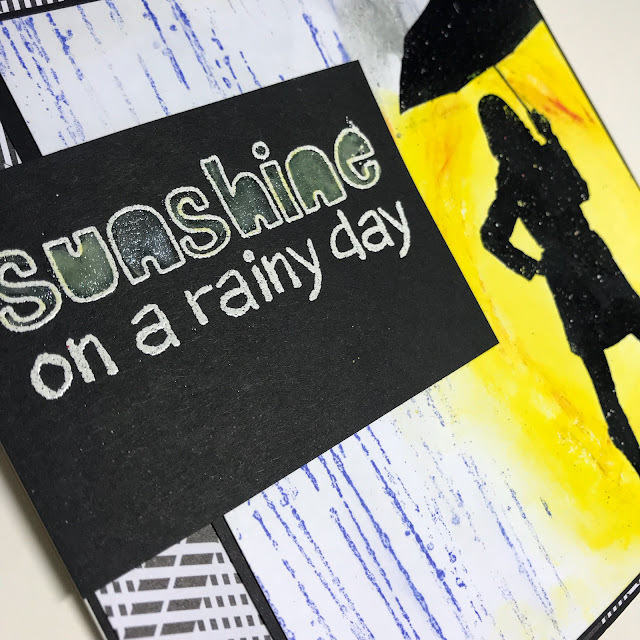 I masked over my image and most of the yellow portions of my card and then stamped some raindrops using blue Distress Inks. I thought the card paired perfectly with this big ol’ happy sentiment from the Express Yourself set. 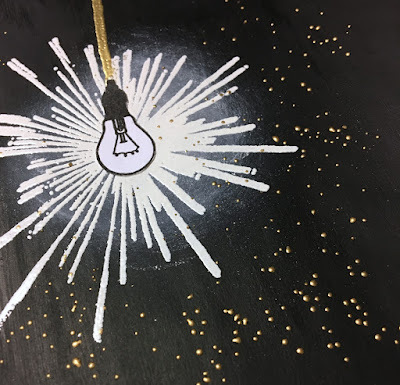 I embossed it on black paper and then painted in the sunshine with a bit of yellow Distress Oxides, followed by a healthy does of Spectrum Noir sparkle markers – because who doesn’t love all things GLITTER!? A little background of patterned paper and viola! My design was complete! Thanks for popping by my friends, and be sure to head over to the Visible Image blog homepage to check out some awesome inspiration! Check out more of our awesome quote and sentiment stamps over in our Express Yourself section, including these..
We will be back a little later with a beautiful tag by Veerle Moreels. Good Evening, we are back with a second dose of inspiration here on the blog today. Hi, I’m mixing a little of the old with the new this week. Today’s project is essentially made like a shaker card in the sense that it has two layers- card and acetate sandwiched between ‘shaker’ foam. I liked the idea of creating a background scene- a land of butterflies behind glass… and where the butterflies escape through the cracks. Using the butterflies from the ‘live life now’ set I heat embossed them on top using dark blue glitter embossing powder. Taking an A4 sheet of heat resistant acetate I also stamped and heat embossed the cracks in black I coloured the centres and extended and highlighted the cracks using a posca white pen. On a separate sheet of acetate the butterflies from the ‘your own kind of beautiful’ set where also heat embossed in black,coloured and on the reverse painted in white to make the colour stand out. After the butterflies were cut out the background was edged using shaker tape. A couple of the butterflies were adhered to the background. The top acetate panel was stuck on top and the rest of the butterflies placed, some half out and the rest free. A black frame was cut and placed on top along with the sentiment which had been embossed in white onto black card and cut out. 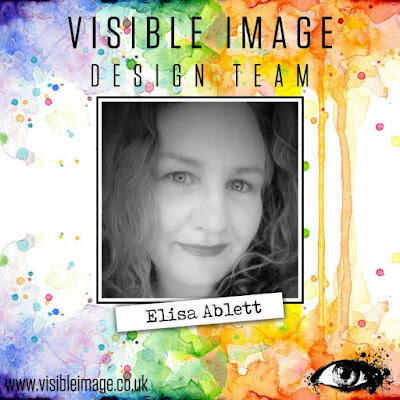 We’ll be back later with fantastic new inspiration from Elisa Ablett! If there ever comes a time when I can’t spend my Friday nights in my studio with my one true love (aka Distress products), I don’t want to live on this earth anymore. This week, I had a chance to play with some of the latest stamps released by Visible Image. When I saw the new Organics set, I knew I had to have it for my very own. When it comes to the perfect artsy stamps for mixed media backgrounds, this is it folks! 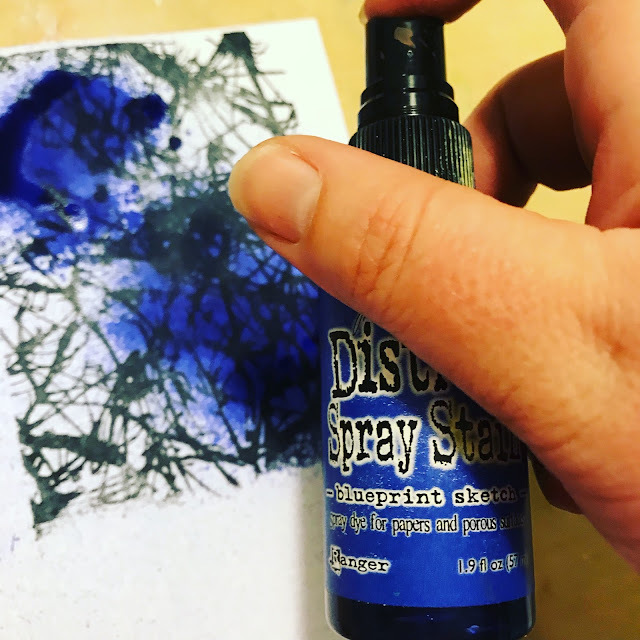 I stamped it on a white sheet of heavyweight cardstock and then I spritzed it with some Blueprint Sketch Distress Spray Stain. To messy things up just a little bit further, I used some picket fence Distress Spray stain and flicked it onto the card using the end of the open cap. I used one of the eye handprints from the In Your Hands set, embossing it in black and fussy cutting and then added two circle cutouts, with a stamped sentiment from the same set to complete my look. Love how this turned out, and it definitely wasn’t too time intensive to make. I can see me using this design for graduation cards or when one of my friends might be going through a tough time. LOVE this card! Such a cool background for our inky handprint! We will be back a little later with a fabulous tag from Veerle Moreels. 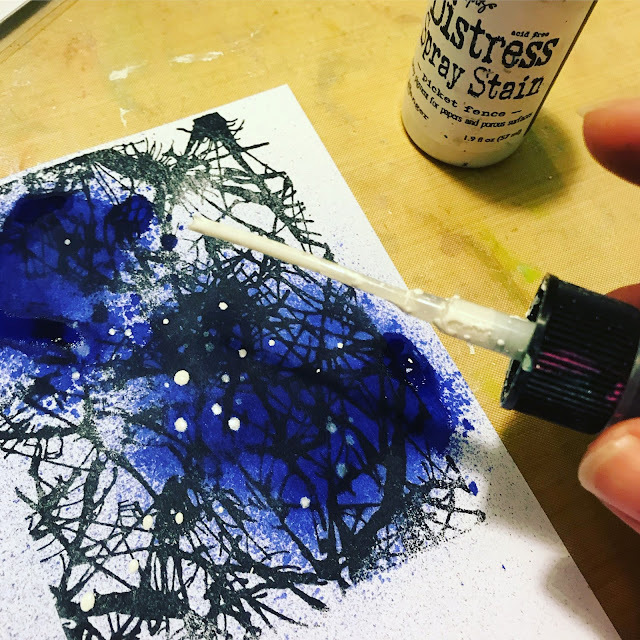 To show you how easy it is to create a galaxy background with the Paper Artsy Infusions, here is a quick tutorial. I picked a mix of blue, purple and pink colors. The exact ones are listed below. I sprinkled a mix of purple and pink onto a piece of card stock. To reduce the mess, I put the paper into a tupperware box. Then I spritzed water on top using my awesome super fine mister. While the paper was still wet, I sprinkled the other colors on top till I had the saturation that I wanted. Then I heat set it. There was still so much gorgeous color left, so I decided to dip the paper into the left over color inside the box. I’m so glad that I did that, because it added the perfect texture. I needed a few stars, so I sprinkled some white paint all over the paper. Next up, I wanted to stamp the Gemini star sign. I wanted to make sure that it sparkles and shines in all its gorgeousness. The Emerald Creek Gold Sparkle embossing powder was the perfect pick for my sparkling focal point. Then I stamped some of the sayings to the inside of the card. At the end I adhered the galaxy background onto a black piece of card stock and both onto a white card base. You will find more of Josefine’s awesome cards and projects over on her blog. We will be back this afternoon with 2 fabulous cards from Pauline Butcher! Happy Tuesday and hope all is well!! 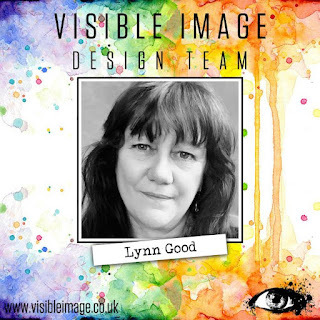 Today is my post for the Visible Image Design Team….Woot Woot!!! Here is my fun creation…..CHECK IT!!! I had a lot of fun with this card!!! 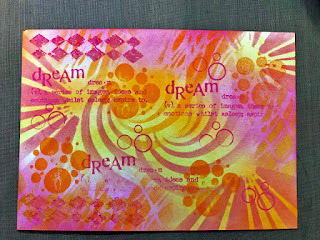 I created this card using the Wake Up Awesome stamp..
And I used the Ink Splats stamp set..
You will find more of Tenia’s fabulous cards over on her blog. Come back later to see 2 awesome tags from Lanette Erickson! Hello and Happy Monday to you! Hope your week has started well. 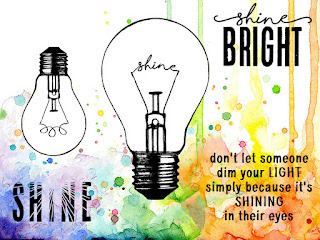 We have double inspiration for you every day on the blog this week… woo hoo! I wanted to design a card showing how the new ‘Written in the Stars’ zodiac stamps work so well with the existing Visible Image stamp range. I used a very summery palette, although we can still only dream of summer at the moment. 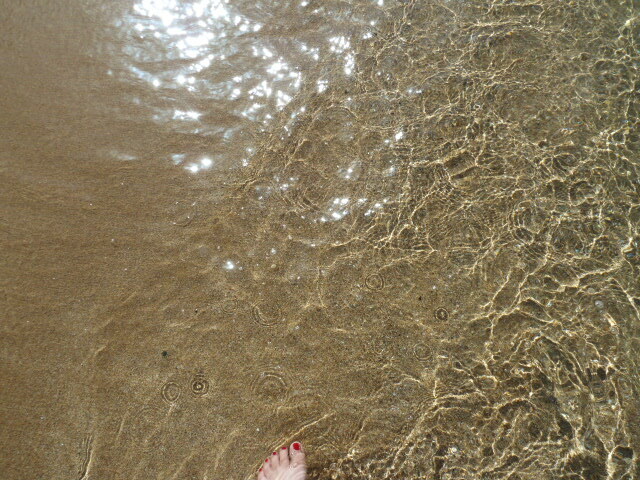 Awww, sand between you toes…what a wonderful thought. We also regularly see freshwater crabs on Rhodes in the butterfly valley and this gave me the idea for my card…. I starting inking my background with salty ocean and and broken china distress oxide inks, using lots of water on my watercolour card. Once dry I blended on some spiced marmalade oxide ink. I used broken china distress ink to add some stencilling to them using the Fibres stencil. To give their shells some extra texture I added some Ranger clear rock candy crackle. I stamped and embossed them using frantage..you will see the sparkle more in a later photo. 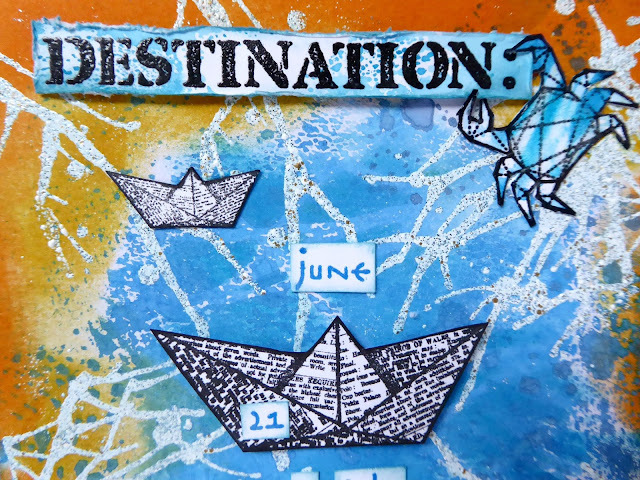 I stamped some of the words from Destination Unknown and some of the fab paper boats which I fussy cut out and added the Cancer birth date details to. 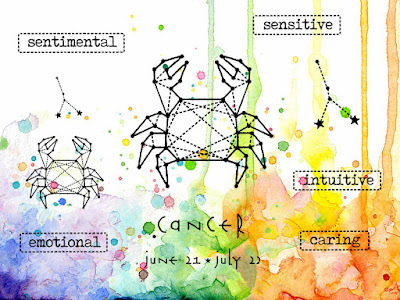 I thought the crabs could “hold” the sentiments. IRL there is a lot of sparkle on my card, difficult to show in my photos but I think the close ups give you an idea. 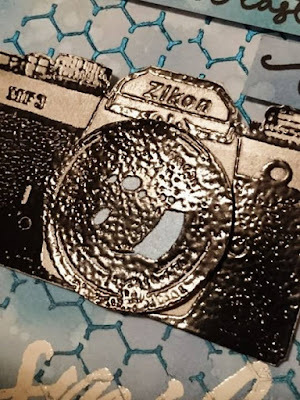 I hope I have been able to show you some different ways of combining your Visible Image stamps, and may have also brought a little bit of sunshine to you on a cold winter’s day. Thanks so much for stopping by today and for the kind comments you take the time to leave me. Such a clever card Jane! 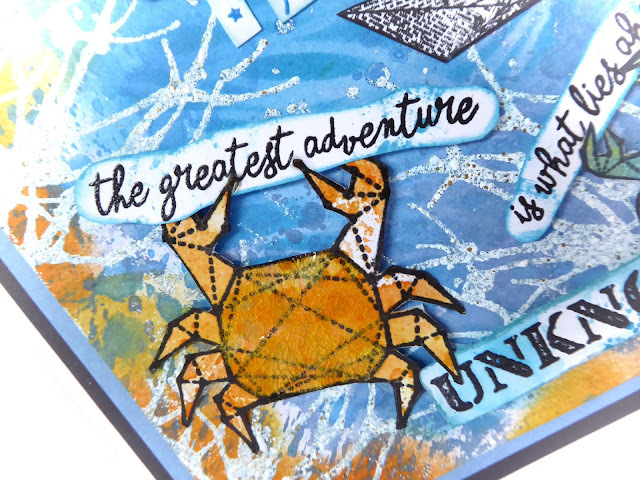 The stamps work brilliantly together and we love how the crabs are holding the words!! We will be back later with a second project from Jane a little later this evening… you won’t want to miss it! Hi there! We hope you are enjoying all the amazing inspiration here on the blog today! Change is good no? It can be scary but sometimes you just have to jump in and make some changes in an effort to make something … better I suppose? You can choose to keep going with the flow, it feels secure and if everything is going smoothly why would you change something? But when you don’t try… how will you ever find out if changing things can get you in an even better place than you already are? With those thoughts in mind I took out my crafting supplies and my video camera to make a new video. We still have so many amazing projects to share with you so make sure you come back soon! Merry Christmas from all of us here at Visible Image! Thank you so much for your custom in 2017, and for loving our stamps and stencils. We would also like to say a BIG ‘thank you’ to all the wonderful store owners – in 15 countries worldwide – who have stocked our products this year! We really appreciate and value your support of our brand! who have created so many awesome, and very inspiring, cards and projects ♡ You are all amazing! We are really excited for 2018, which kicks off with Creativation in Phoenix!! We can’t wait to show you our NEW stamp designs in January! We are now closed for the Christmas holidays, and will re-open on Tuesday January 9th. All orders placed over the festive period will be dispatched on our return. We’re sending hugs to anyone who will find Christmas particularly tough. We hope you have a wonderful time and we wish you a very happy, healthy 2018, full of only good things. Hello! Hope you are having a great day! But you can’t escape if you are not opening your mind for new beginnings. It might not be as easy as writing it down here, depending on what you have to leave behind. Those stars might not be as bright as they should be, but give it time and believe that those wings will show you their true color. Those stamps from Visible Image… they all make it so easy to put down so many of my thoughts. And just another picture to show you the fabulous texture you can create using their stencils. We will be back later with the very first Design Team inspiration from Sharon Traynor! Hi there! We say our last rather sad Design Team ‘farewell’ this evening… to Nicky Gilburt. We met Nicky at a craft show back in May 2016 after she wowed us with some of her cards over in our Facebook group! We especially love the very special ‘Team Awesome’ card! Nicky’s last post for us can be found over on Nicky’s blog. We’re sure you have lots of very exciting adventures ahead, and we wish you all the very best for the future. We will really miss working with you. We are sharing some of our favourite projects by Elina Strömberg on the blog this evening, as we say ‘thank you’ and farewell. We wish you all the very best for the future Elina! 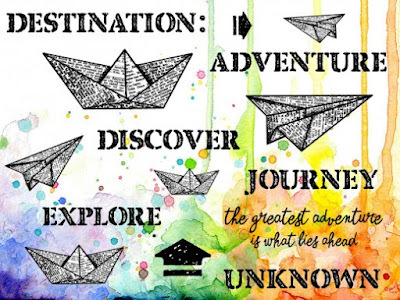 We know you have lots of exciting adventures ahead! Hello! We have another dose of fabulous inspiration here on the blog this evening! I chose to just use the stripes, and masked off sections so I could apply a rainbow of Distress Inks through the stencil. 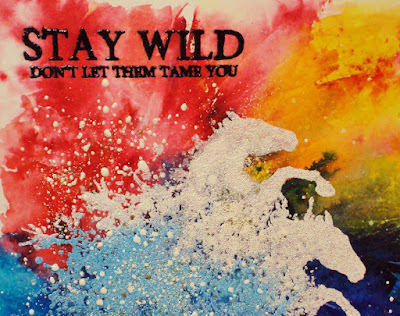 I chose the little horses from the Stay Wild set, making them look as if they were leaving trails of colour behind them. The wonderful sentiment is stamped in black Archival ink as are the horses. You can find more of Teresa’s inspiring projects over on her blog. Make sure you enter your cards and projects featuring our stamps and stencils into our Facebook group ‘Show & Tell’ album this month for your chance to WIN a £25 coupon! We will be back with some gorgeous Christmas inspiration from Pauline Butcher tomorrow. Hi there! We are back with more awesome inspiration this evening. I got the idea for this page when flipping the pages of my Moleskine art journal. 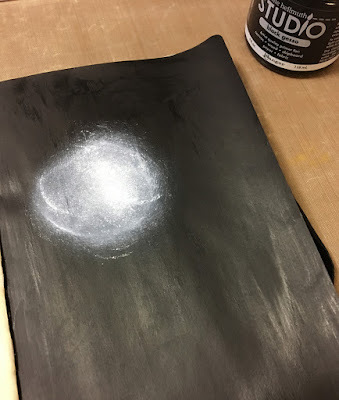 I came across a page I had painted with black gesso, and thought that a dark, solid black background would match perfectly the strong quote stamp text by Visible Image. Once the paing was dry I stamped and heat-embossed the light ray pattern and the sentiment text on the page. The light lightbulb is stamped on white paper, cut out, and glued on the page. To add even more glimmer, I sprinkled some gold colour heavy embossing powder flakes on the page. I did not use any embossing ink, so for keeping the flakes on the paper during heating, I heated the page from underneath. Worked out well! We will be back a little later with a brilliant card from Teresa! Hi! Thanks for visiting our blog today! It’s been a very busy start to the week here.. packaging lots of gorgeous stencils, designing awesome new stuff for 2018 and of course packing and sending lots of orders to our wonderful customers and retailers! We’ve also been planning our October shows on Create and Craft TV… get the 27th & 28th in your diary! Hello – I’ve been playing with Distress Oxide Inks whilst trying to create a birthday card for my friend Elaine (aka Archie). the Butterfly from the ‘Live Life Now’ set and Black Archival ink. before stamping the Butterfly image twice to finish. The ‘friend’ stamp is from my stash. You will find more stunning inspiration from Eileen over on her blog. Thanks again for visiting our blog today, and don’t forget to enter your cards and projects featuring our stamps and stencils into our Facebook group ‘Show & Tell’ album this month for your chance to WIN a £25 coupon! We will be back tomorrow with more fabulous inspiration! Hello! Happy Friday to you! Today we have some more gorgeous Christmas inspiration to share with you here on the blog. 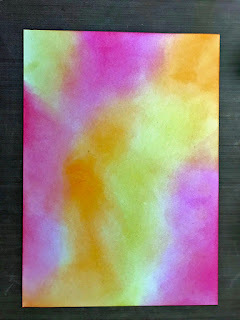 I used Distress Inks and the Fibres stencil to create my background. Stamping and embossing the snowflake with Sparkling Snow embossing powder from WOW Powders. We will be back with fabulous Christmas inspiration from Pauline Butcher later today! Hello! Thanks for visiting our blog. Just parts… that’s all I saw when making this project. Or look at it as making more out of your materials. You already know I immediately fell for all the beautiful words in the Family definition stamps, and how I wanted to be able to use them on their own too. Now when seeing the Fibres stencil… yep I was doing the same thing. Looking for parts I could isolate and use on it’s own. I’ve kept it white but layed down some pearlescent watercolors on my structure paste to give it a soft finish. A shame it wasn’t that easy to catch in on my photograph. We will be back with more fabulous inspiration tomorrow! Hi there! Happy Monday to you! Hope your week has started well. I created the drop shadow by placing my stencil on the card and inking with Hickory Smoke Distress Ink, once dry, I moved the stencil slightly and inked through with Versamark ink then heat embossed with WOW Embossing Glitters. It gives a really effective 3d look to the stencilling. The guitar is stamped and embossed onto another piece of card then fussy cut, and attached with 3d foam. We will be back with more gorgeous inspiration later today! It’s Thursday, and it’s Visible Image time once again. I have another card using stamps and another new stencil.. this time it’s the Strobes design, and I created a spotlight effect for this card. I coloured my card with Mustard seed Distress Ink leaving a white area in the middle. I blended a little Twisted Citron around the edges to darken slightly. Then I placed the sencil on the card and went over it all with Black Soot Distress Ink, keeping it lighter in the centre to create my spotlight effect. I used WOW powders fluorescent colours to emboss the other images – I love how the colours pop against the background. The strobes stencil looks amazing with our singer! We will be back with lots of gorgeous new inspiration next week. We are heading to London tomorrow for the fantastic ‘Crafting at Ally Pally’ show… our favourite event! Looking forward to seeing lots of customers and friends there. Thanks for stopping by today, have a fantastic weekend! It’s time for my weekly inspiration for Visible Image. Today’s card is another of the samples I made for the Create and Craft TV shows. 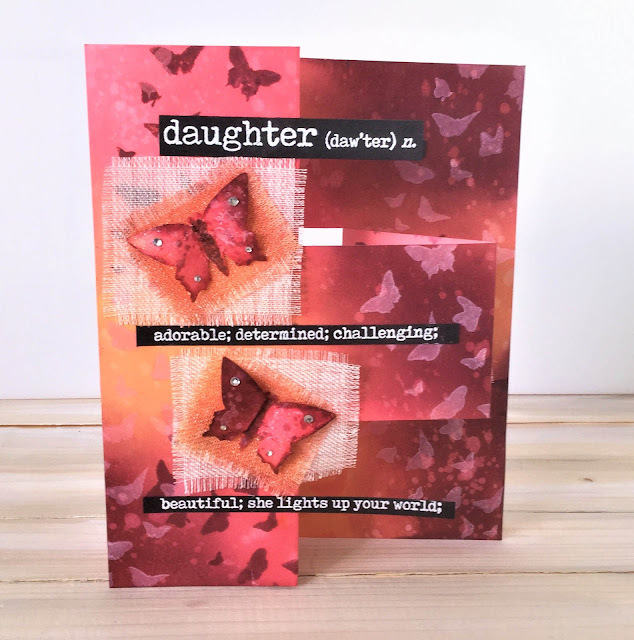 I used Distress oxides through the strobes stencil and then added the Father sentiment plus some accent stamps from the Own it! and Create it stamp sets. We also have a “distressed” challenge running during September over on our Facebook page…do come and join us..you could win £40 voucher to spend on your choice of Visible Image stamps. Back soon, and if you are going to the Stamping Show at Ally Pally on Sunday.. do shout and I will say hello! I will also be catching up with Helen and Mark at the Visible Image stand. Bye for now…I need to get back to the beach ? Love this Jane! Thank you ♡ Great Autumn inspiration too.. the little tree and leaves are so awesome! 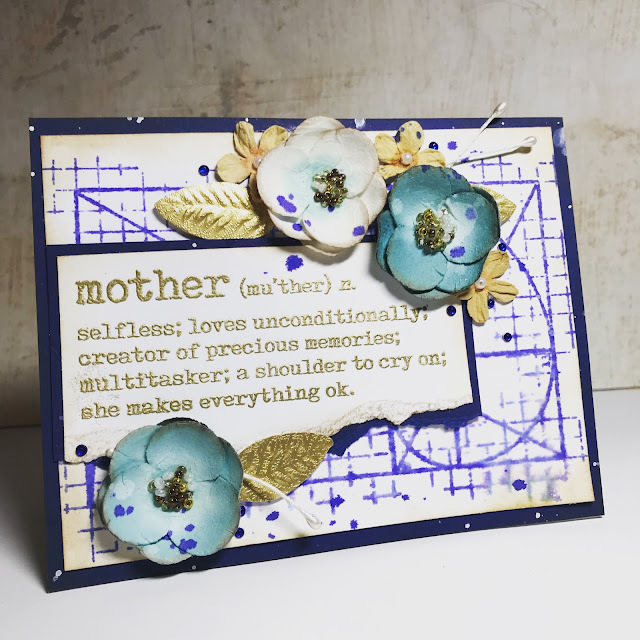 You will find more of Jane’s inspiring cards and projects over on her blog! We have been busy catching up with all the latest Design Team inspiration here on the blog over the last few days, so if you have missed any of our recent posts you will find them all HERE! Thanks for visiting our blog and we hope you enjoy the rest of your day! We will be back tomorrow with some ‘distressed’ challenge inspiration from Corrie! Today I have a tag to share for Visible Image. I made this way back early August as I am away in sunny (one hopes) Brighton at the moment! After cutting a tag out of watercolour paper I dunked it into two of the new Distress Oxide colours; wild honey and twisted citron. 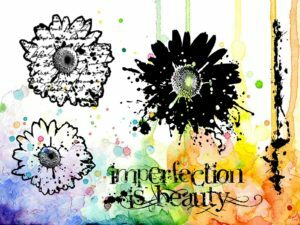 Once I was happy with the background I stamped it with one of the flowers of the ‘Imperfection is Beauty’ stamp set, using the same inks. While the ink was still wet I sprinkled clear embossing powder over it and heat embossed it. I then added some white splatters. 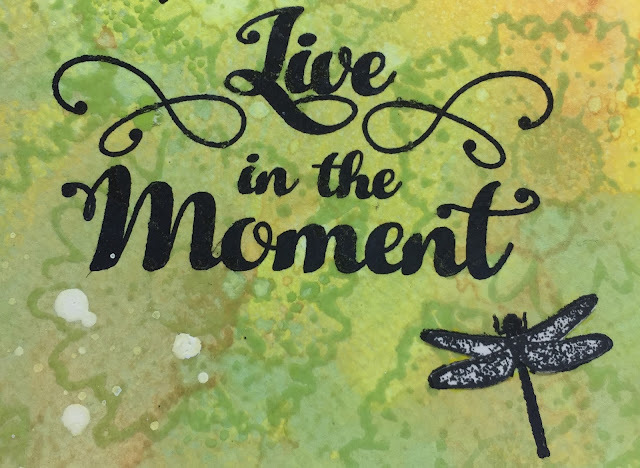 I then stamped the sentiment and the dragonflies from the ‘Live in the Moment’ set. I clear embossed the sentiment also. The wings were then stamped again on book paper and adhered over the ones already on the tag. A ribbon and some doodling around the edges finished it off ! Loving that background! Thanks Corrie! 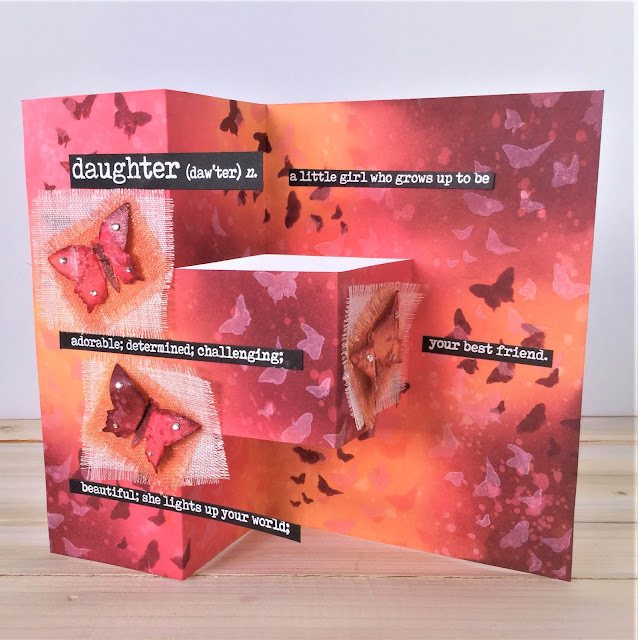 You will find more of Corrie’s fab cards and projects over on her blog. Don’t forget to show us what you have been creating with our stamps over in our Facebook group… enter our challenges for your chance to WIN a coupon! Did you check out our awesome NEW stamp designs yet? And our brand new range of stencils!!! Head over to our Shop! These new products will also be available from your favourite Visible Image stockist soon! Hello there! Thank you for visiting our blog today! It’s been a Bank Holiday weekend here in the UK so we have enjoyed a day off, and had a BBQ in the sunshine with the family! Today I have a bit of a red white and blue theme going on…something patriotic! Visible Image have brought out a brand new range of stencils and the first I have had the pleasure to play with is none other than the brilliant Grungy Union Jack which can be pre-ordered now! Isn’t it gorgeous… I love those grungy drips. These have been designed by Mark and made for Visible Image by Tando Creative. They are fab quality and thickness, a generous 6X6″ size and are available to pre order here There are 10 designs, all are awesome, do check them out! 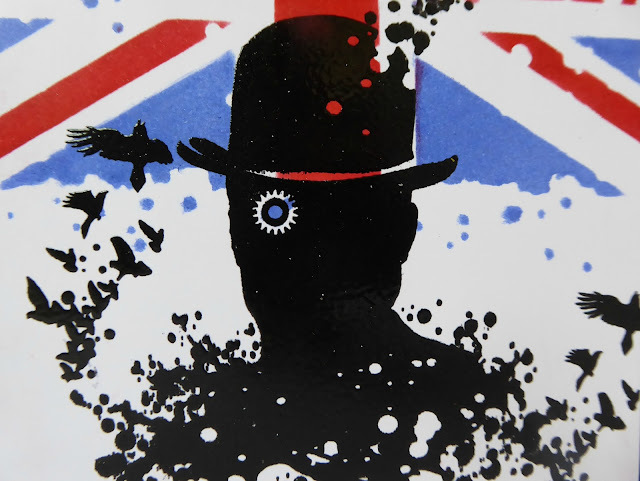 yes the bowler hatted man from the Ahead of our Time stamp set. I kept to the red. white and blue of the flag and inked it up using Distress inks. Meet Mr Union Jack ? I am loving playing with these new stencils and have been making more samples for the next Create and Craft TV show on 8/9th September. I will also be sharing another of my stencil makes next week. Thanks again for visiting our blog today, and don’t forget to check out all our NEW releases HERE! Hello! This weekend we have launched our ‘September release’ designs for pre-order! For those of you who make cards for charity, or to sell, we think they’ll be a real hit! Available to pre-order NOW! Or from your favourite Visible Image stockist very soon! We’ll be back soon with our exciting NEW product reveal… stay tuned!!! Hi there! We have more gorgeous inspiration to share with you here on the blog today. Today my inspiration for Visible Image is inspired by “Swan Lake” after a recent visit to a boating lake. It got me thinking and reminiscing about ballet. My daughter, in her time was quite a ballet dancer and even had the chance to dance a couple of sessions at the Royal Ballet’s White Lodge in Richmond as a teenager. Even as a junior doctor she tried to get to a ballet lesson whenever she could. Her young children and busy life as a GP mean that disappearing off to ballet is not possible for now. I am sure in the future though she will get back to her dancing. My Mum also used to take her regularly to see ballet shows in London,from a very early age right up until she moved out of London. I have also been to the ballet many times with my Mum. We have seen all the major ballets including Swan Lake. Most recently I even managed to drag my Hb along. which I then fussy cut out. There is a great mix of words you can use in this set. I decided to use the words below. I stamped on some the stars and die cut out my focal. Then I put on my creative hat to put together my card. I added a Noor star diecut using black card and filled in one of the stars with red glitter for some bling. I also added red brads to the stamped stars and ribbons to the shoes . I used some of my home printed music paper.This card brings back memories of the hours I spent when my girlie was a teenager sewing ribbons into her new satin ballet shoes. Here is a close up the sweet shoes. Have you subscribed to our Newsletter? Don’t miss previews of our ALL our NEW designs coming this weekend! Thanks for visiting our blog and we hope you have a good day! We will be back later today with previews of our NEW words stamps! Today I’m sharing my completed holiday journal from our recent adventures in Portugal. This was a real labour of love but holiday journals are so worthwhile. There is nothing better than looking back through them and revisiting awesome memories. The following page was for our day out in Lisbon. Each day we took some Instax photos, as well as using my usual camera. These photos measure approx 8.5 by 5.5cm. I use the colours in my photos to inspire each page. I first made a background using stamps from Mesh-ellaneous. These are such cool stamps! I had fun playing with a background pattern. Don’t you just love the paper boats…I do ? This project was a real labour of love but so worth doing… there are a lifetime of memories inside my journal. I really hope that I might have inspired you to create your own holiday journal. Thanks as always for stopping by and for the kind comments you take the time to leave me. Wow a real labour of love for sure… such a great way to remember wonderful memories made. If you would like to see more close ups of Jane’s holiday journal, head over to her blog! Have you subscribed to our Newsletter? Don’t miss previews of our NEW designs coming this weekend! Thanks for visiting our blog and we hope you have a great day! We will be back later with more fabulous inspiration. It’s time for me to share something I’ve created using some fabulous Visible Image Stamps. the flower and the crackle stamp from Create it! The background was a achieved by blending three colours of Oxide ink randomly, then spritzed with water. On top of this I blended the same inks through a small dotty stencil, again randomly. I then stamped the beautiful face, using Versamark, and heat embossed it using a Black Sparkle embossing powder, whitening the eyes with household bleach on a paintbrush. I stamped the crackle stamp with some pink Oxide ink, down one side of the face, then stamped again using blue Oxide ink, when dry, I added a touch of pink and blue Stickles, to give them sparkle. The lips were coloured with pink Stickles, and the eye shadow is blue Stickles. Using a palette knife, I spread some translucent stencil paste, through the dotty stencil, just in the neck area. I removed the stencil, and sprinkled glitter over the wet paste. I stamped loads of flowers with Versamark, and heat embossed them, some with pink sparkle embossing powder, and some with blue sparkle embossing powder, then fussy cut them all. I shaped them with my fingers, glued a gem in the middle of each, then added them around the face using 3D glue gel. 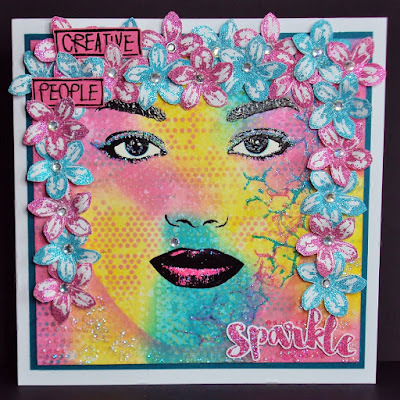 The words ‘Creative People’ was stamped with Versamark onto pink card, and heat embossed with black sparkle embossing powder, fussy cut, and positioned into the flowers with 3D glue. ‘Sparkle’ was stamped again using Versamark, and heat embossed with Pink Sparkle embossing powder. Thanks for dropping in today. You will find more of Pauline’s wonderful cards and projects over on her blog. Want the chance to WIN a Visible Image coupon??? Just enter anything you have made with our stamps this month into our ‘Show & Tell’ album over in our Facebook group! We will be back with even more fantastic inspiration soon. If you have missed any of our recent posts, you’ll find them HERE! My Visible Image project today is a mixed media Monolith full of texture and layers. This was produced for Craft Stamper earlier this year. The background is created with layers of crackle paint and vintage ephemera, giving a feeling of timeworn decay. 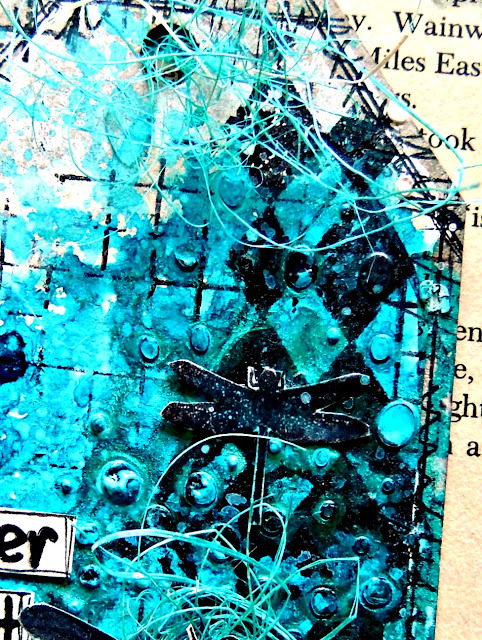 I stamped words directly onto the background as well as onto paper that was collaged over the ephemera. My cage is half of a Christmas ornament, given a rusty makeover with paint and sand texture paste. Inside is a Prima lightbulb embellishment which I coloured with alcohol inks. My stamped moths are backed with gilding flakes for a beautiful metallic glow. I hope you enjoyed taking a closer look at my piece today and are inspired to create something similar. We adore this… so much to discover. Incredible texture and a brilliant interpretation of the quote! We will be back a little later with another awesome project! Good afternoon, another week is here and it is time for my dose of inspiration for Visible Image. For today’s project I used the ‘Believe in Unicorns’ set.. I started to make a Distress Oxide background for the unicorn. However, as made the background it made me think of the age of the universe. I stamped the moon using Faded Jeans Distress Oxide ink. As I looked at the moon in the sky for some reason Pegasus, the ancient mythical winged horse, came to mind. Now the unicorn in this set has a horn and no wings but Visible Image also made this wonderful set called ‘Angels are Near’..
which does has a fab set of wings! So to bring Pegasus alive I masked off the unicorn’s horn before I stamped and white embossed it onto my inky background. I stamped and gold embossed the wings onto black card and fussy cut them out. I also used the birds from the ‘Learn to Fly Again’ set.. I played with the position of the wings until I was happy with them and then put on my creative hat to put my card together……my unicorn underwent a metamorphosis…..
You will see that I also stamped the cloud stamps over the moon and used the sentiment from the ‘Angels are Near’ set. I added some gold glitter to his hooves to speed him on his journey…. Thanks for stopping by today and for the kind comments you take the time to leave me. Enjoy a creative week ahead. You can find more of Jane’s inspiring cards and projects over on her blog. We will be back later with more awesome inspiration! If you have missed any of our recent posts you will find them all HERE. We hope you love them! And.. we’re bringing back our gorgeous ‘Go To Christmas Words’ set too! We also have some inspiring NEW words stamps launching next week… original quotes by Helen designed awesomely by Mark.. a real team effort! If you follow us on Facebook or Instagram we are sharing previews daily! Now what to create…how about a trio of ATC’s? I first colored a piece of paper the size of 3 ATC’s and stamped on it. Then I glued down my spider web die cut. When you cut up the paper into 3 ATC’s you have patterns that run from one ATC onto the other. You will find more fantastic projects over on Veerle’s blog. We’ll be back soon with another fabulous Design Team project! Thanks for visiting us here today on the Visible Image blog, enjoy the rest of your Saturday. My Saturday share for Visible Image is this card made with the awesome camera from the Capture the Moment stamp set, a beauty to stamp and build up the layers of the lens. I used all the elements from the set, as you see, I love the huge ‘smile’ stamp and the text is just perfect. I stamped my image and heat embossed onto white card with black powder, then cut round it, repeating the lens area a couple of times. Then I used my silver Nuvo Embellishment Mousse and a sponge, and rubbed the colour all over the parts I wanted to look metallic, and wiped the embossed areas clean with a cloth. I love the effect that this created- as realistic as a stamped camera can be! The background was created with Distress Oxides, splashed with a little water, then a funky chicken wire stencil which I also applied blue Nuvo Embellishment mousse through, as this gave a slightly raised texture to the background. A smudge of silver across the wire gave the project a distressed look to finish. Brilliant card Nicky! The camera looks amazing! Make sure you share your Visible Image creations with us in our Facebook group, there’s the chance to WIN a great prize! You can tag us on instagram @visibleimagestamps and on twitter @visible_image! Thanks so much for stopping by today, hope you are having a great weekend! We will be back with more awesome inspiration from our amazing team later! And keep your eyes out for previews of our awesome NEW designs coming soon!!! Hi there! We hope you are having a great weekend so far! 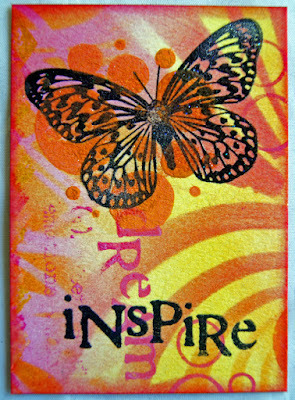 It’s my turn to share a little inspiration using some awesome Visible Image Stamps. The background is Brusho’s on watercolour card, I love the intense colour that Brusho’s give you! When they were totally dry, I stamped the horse twice, using Versamark, heat embossed it with 3 glitter embossing powders, then sprinkled some white Frantage (it’s like a ultra thick embossing powder with glitter in it) onto the top, and heated it from beneath. There are two sentiments in this set, and I chose ‘Stay Wild’ for this card. stamped with versamark, and heat embossed with black embossing powder. This photo shows the sparkle! Thank you for popping in today. Awesome card Pauline! The colours are so intense and the horses look amazing! Thank you! Want the chance to WIN a coupon??? Enter anything you have made with our stamps this month into our ‘Show & Tell’ album over in our Facebook group! We will be back with more fantastic inspiration a little later. I actually made this way back earlier in the year for Creative Stamping magazine. 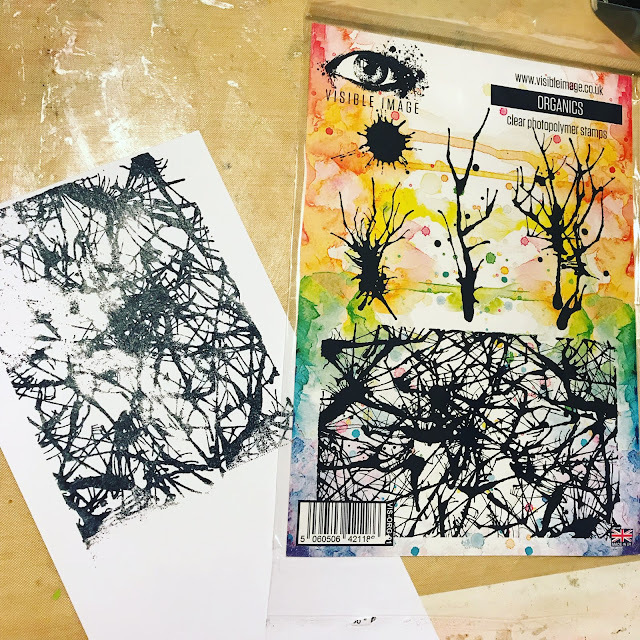 I love creating weathered effects with acrylic paint and when I was asked to create a mixed media project with the Dare To Swim set, I couldn’t wait to get started. The rusted panels are created from mountboard and flat backed gems, painted with washes of acrylic and an application of Antiquing Cream. The underwater scene is painted onto the centre panel and has a shimmering shoal of foiled fish. The beautifully detailed jellyfish is stamped and embossed onto acetate and glittered for an etheral effect. A group of stamped bubbles covered with Liquid Glass decorate the central frame. I hope you enjoyed taking a closer look at this project. You can find more of Teresa’s projects over on her blog. Thanks for visiting our blog today, we’ll be back soon with more brilliant inspiration. Hello! Sorry our blog has been neglected lately! Between very high order volumes, exciting new releases (coming soon! ), and searching for the perfect person to join the team here at Visible Image, there just haven’t been enough hours in the day lately. Gorgeous notebook decorated by Veerle Moreels! Veerle has used a delicate purple to add a splash of colour to the flowers. This would make such a beautiful gift. Incredible card by Jane Tyrrell! 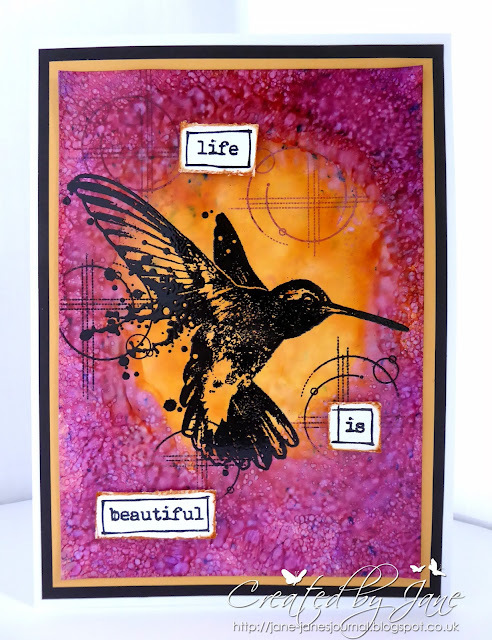 Jane made an Infusions background, and embossed the fantastic time swirl stamp and birds in gold wow powder. The falling man and woman were embossed in black then fussy cut out. Jane created her clock hands using a die cut, and attached the gorgeous stamped sentiment. The man was adhered to the clock hand as if he’s grabbing it, trying to turn back time to find his love sooner! Great bookmarks by Elina Stromberg! Elina cut two panels from white cardstock, and inked them with bright Distress Ink colours. 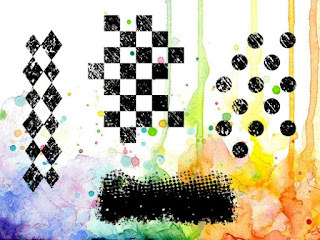 Before stamping the jazz and trumpet player images and quote on the panels, she sprinkled plain water on the inked surface to create fun splash textures. Love the added touches to the bottoms, giving the effect of a piano! Awesome card by Corrie Herriman! Corrie sprinkled Brusho’s onto white card stock and rubbed them in using her finger. She used the ‘stand out’ stamp from the set with water to stamp onto the card. This is like magic!!! Corrie then slightly misted the card with a little water. Corrie then stamped the legs on the card together with the quote. On a separate piece of card she stamped the shoes again, this time with green ink, and when this had dried added some shading with a coloured pencil. The shoes were cut out and adhered on top of the others. A few white accents finished it off. Gorgeous card by Dot Leathbridge. 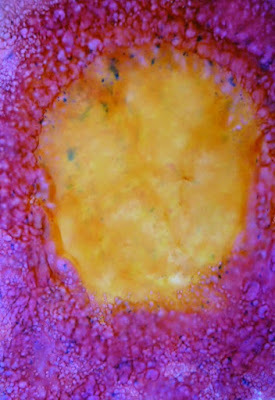 Dot has been playing with Distress Oxides to create her fabulous background. The jelly fish and bubbles were stamped first, then masked off. This fantastic stamp set comes with extra bubbles so Dot has added them to create a whirlpool of air bubbles as the jelly fish swims along. Then the card was smooched through Distress Inks, dried, stenciled, stamped again and finished with the removal of the masking. Dot really wanted a water-line at the top so that the sentiment could be added ‘out of the water’, but it just didn’t happen! So that is why there is a ripped section – it’s a compromise. The words are white embossed with a little black fine-liner added around the letters for shadowing. Fantastic tag by Teresa Morgan! 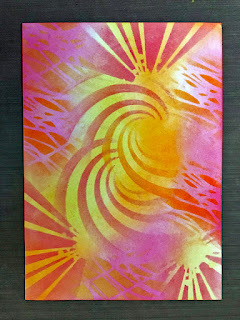 Teresa sprayed some Dylusions spray inks to create her background, and set aside to dry. The singer is stamped onto some white card and fussy cut leaving a narrow white border all around. Teresa stamped and embossed the word ‘sing’ onto white card, cut it out and matted onto black card, Once the background was dry she stamped the diamonds using Distress Ink and added extra detail with a black fineliner. Teresa also did some scalloped doodles around the edge of the tag, stamped the sentiment across the bottom, then drew a straight line with a fineliner and ‘stood’ the singer on it. Super sparkly card by Pauline Butcher! The background was created with Distress Oxide Inks, and stamps from the De-stressed backgrounds set. For the jumping girl, Pauline used Versamark with two different types of Embossing powder: a sparkly red and a fluorescent pink! These were sprinkled on randomly, and then heated. Pauline also used red Stickles for added sparkle, and a white pigment pen to make her pop! The sentiment was stamped onto white card, and heat embossed with black powder, the words were then fussy cut and some pink ink added around the edges. Beautiful card by Nicky Gilburt! Nicky has chopped up our ‘Life Can Be Tough’ sentiment stamp to create new sentiments to repeat stamp over her background, and to break up the words for this card which features our ‘Face it’ stamps as the focal image. Nicky has also used some of our ‘Visometry’ stamps and the fabulous crackle stamp from ‘Create it’ in the background too, just to add a little depth. It’s great fun creating new phrases and quotes by cutting up or masking your stamps! We have lots more of their stunning creations to share with you over the next few days! We hope you are feeling inspired ♡ You will find loads of gorgeous projects over in our galleries too! Want the chance to WIN a £25 coupon? Enter anything you have made with our stamps this month into our ‘Show & Tell’ album over in our Facebook group! Thanks so much for visiting our blog today. Hello! We are back after our summer holiday, feeling recharged and excited for what’s coming next from us here at Visible Image! 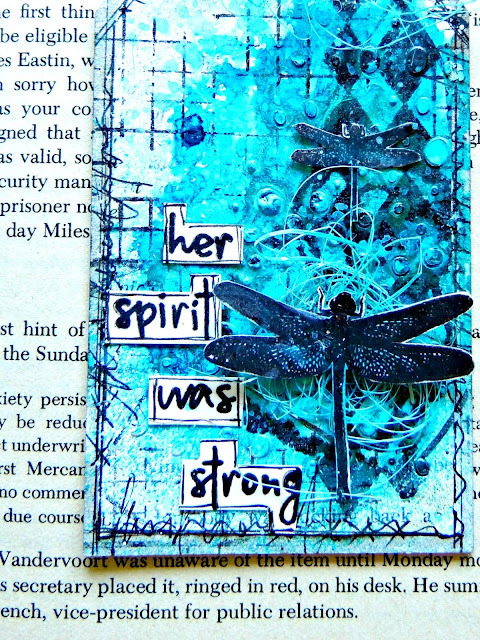 The background was achieved using Distress Oxide inks and a stencil, and the other components were stamped onto white card, using versamark, and heat embossed: rain lady with Wow Fairytale, and the wings and the sentiment with Black. I fussy cut them, and layered them onto the card using glue gel.